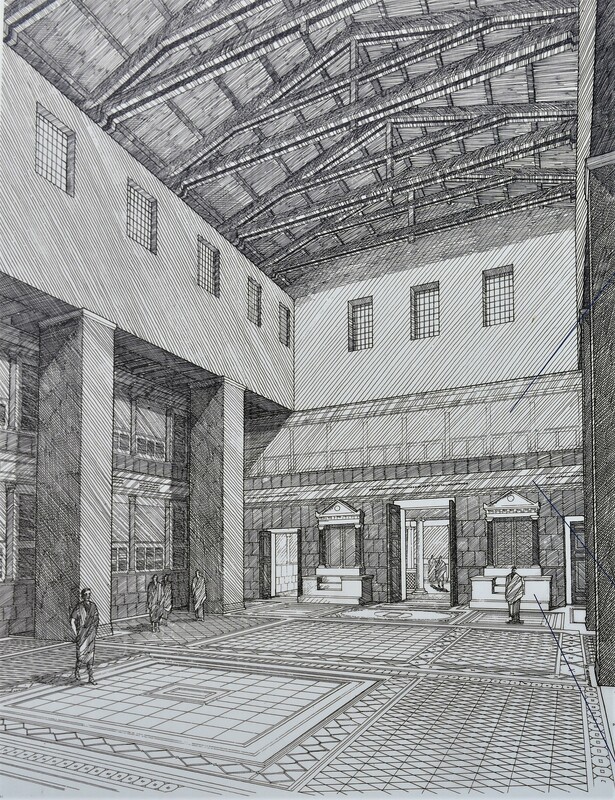 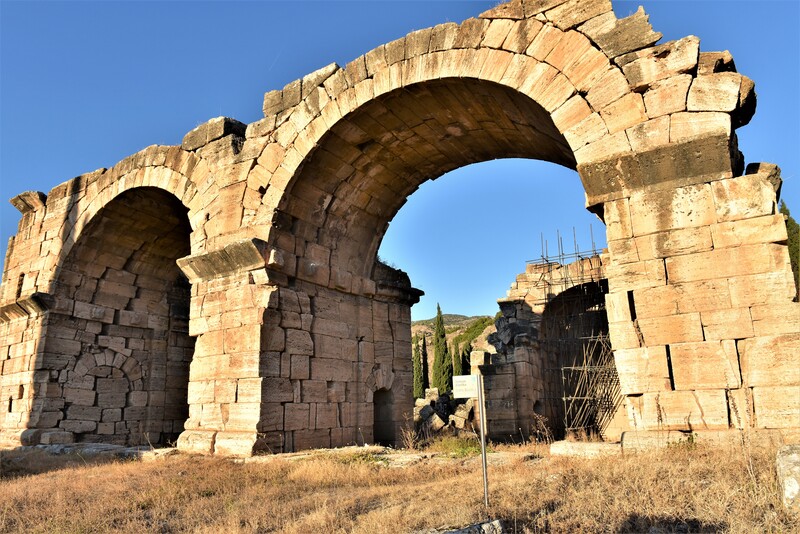 The Romans built the thermae (baths) that became significant and magnificent monuments of the ancient architecture during the end of the 2nd century AD. 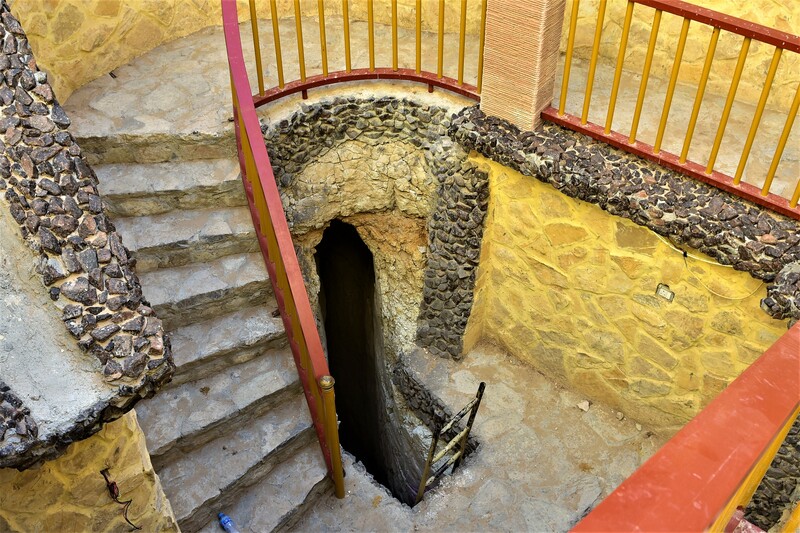 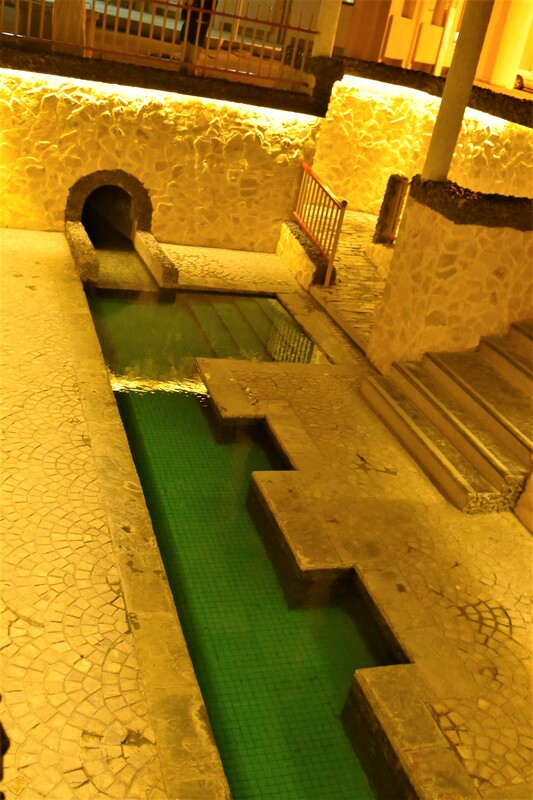 The baths occupied an area over 7,000 square meters. 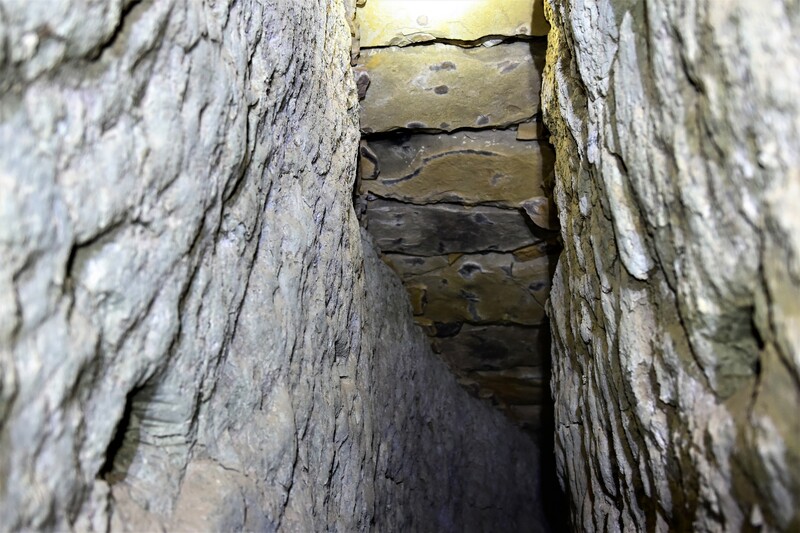 Surviving walls reach 22 meters in height at some locations. 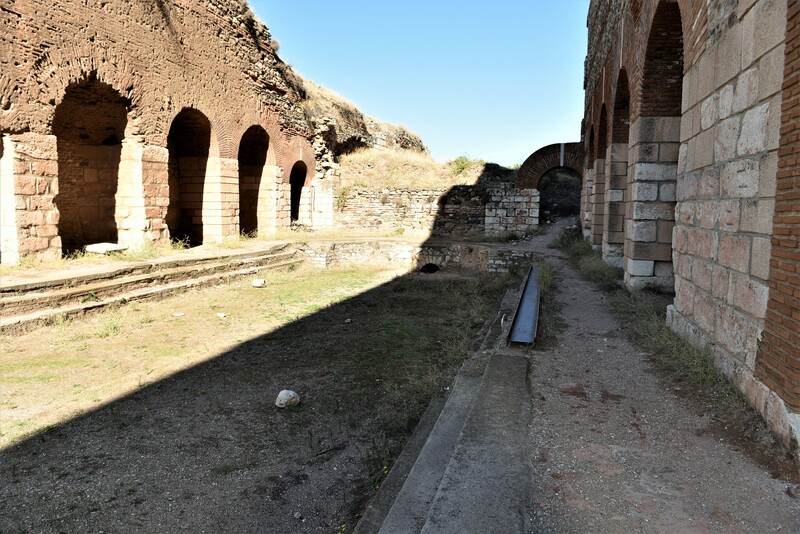 Photo taken at modern day entrance to site on west side of the thermae. 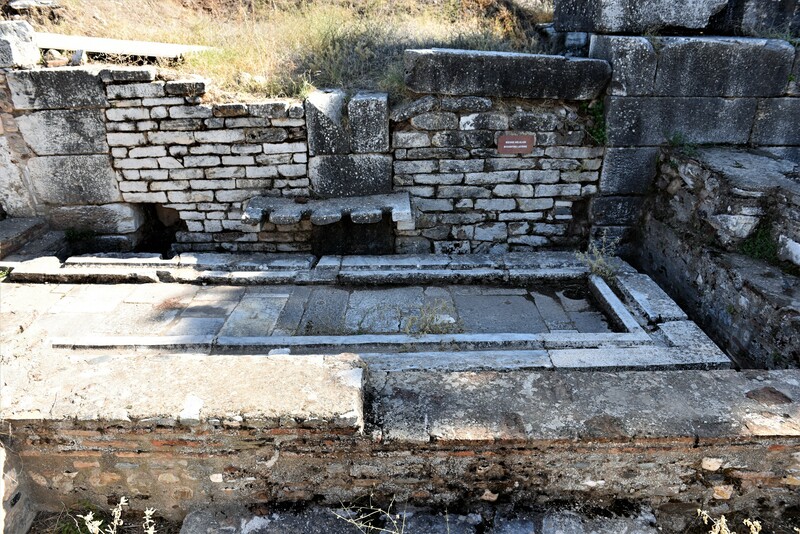 Hypocaustum or underfloor heating system – showing terracotta pipe. 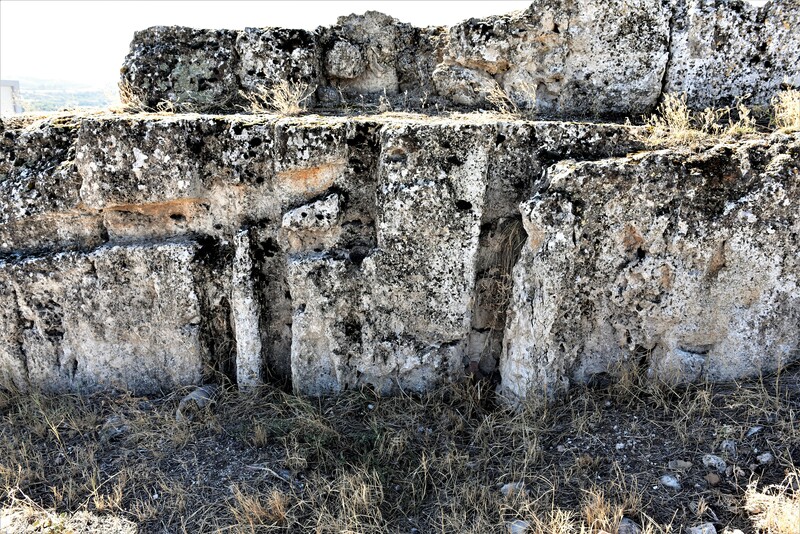 Main aqueduct of ancient Odessos and the entry point into the Odessos Fortress were discovered by archaeologists in Varna at the site of an excavation for a building with the ground floor being a coffee shop with the aqueduct and fortress wall remains seen from inside the coffees shop through the floor and viewing wall. 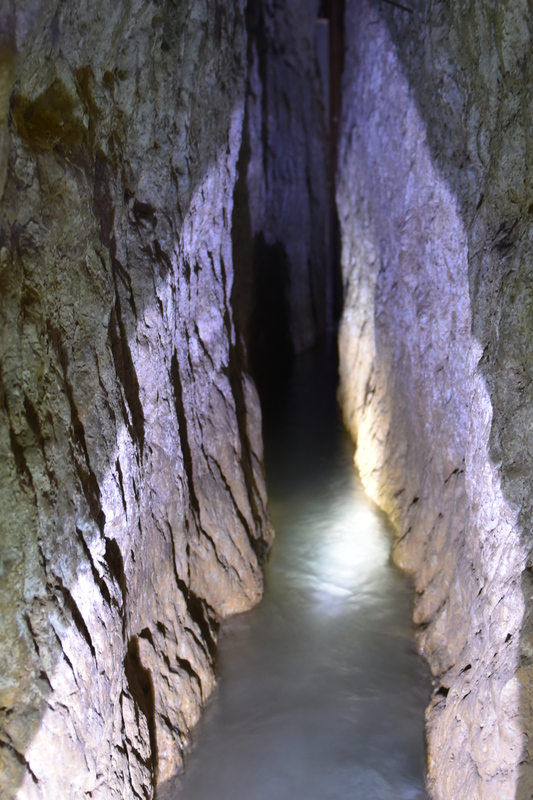 Photo of aqueduct taken through glass floor of Muro Coffee Shop. 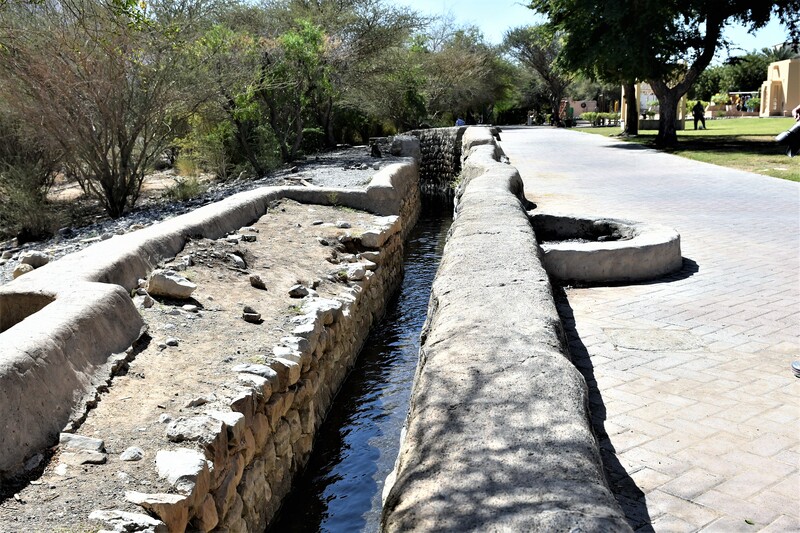 Coffee shop (Muro) where main aqueduct was found during excavation for foundation of building. 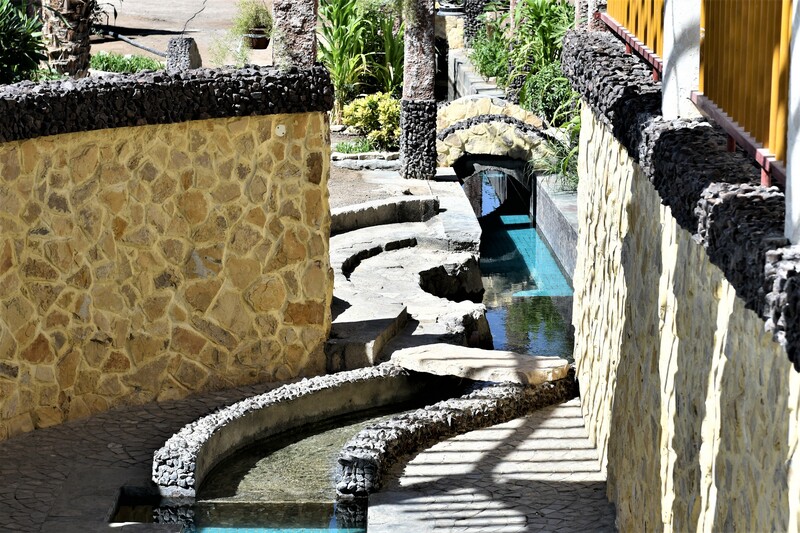 We visited Assist. 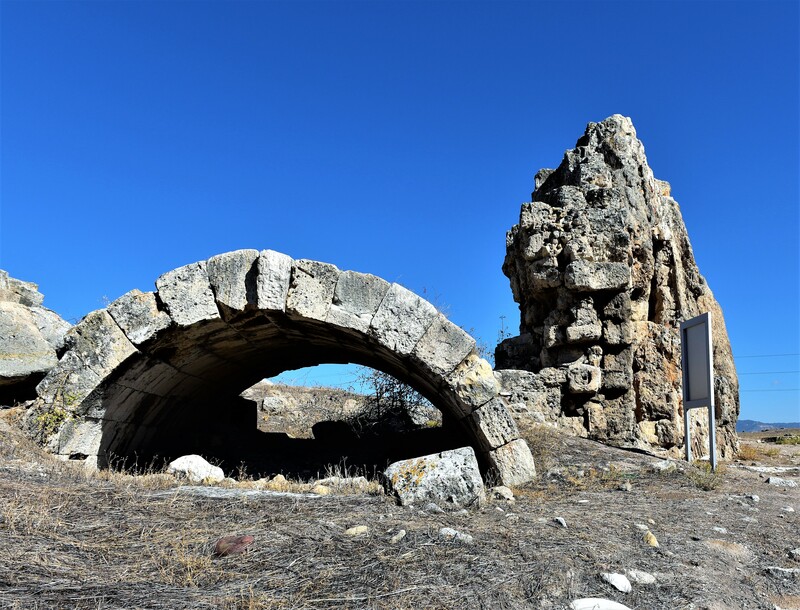 Prof. Dr. Hirsto Kuzov of the Varna Museum of Archaeology who was instrumental in the success of this excavation and protection of the remains. 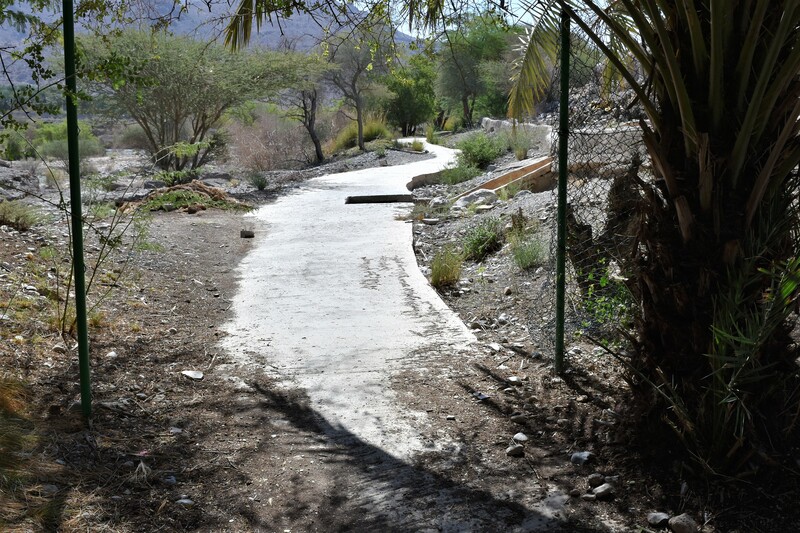 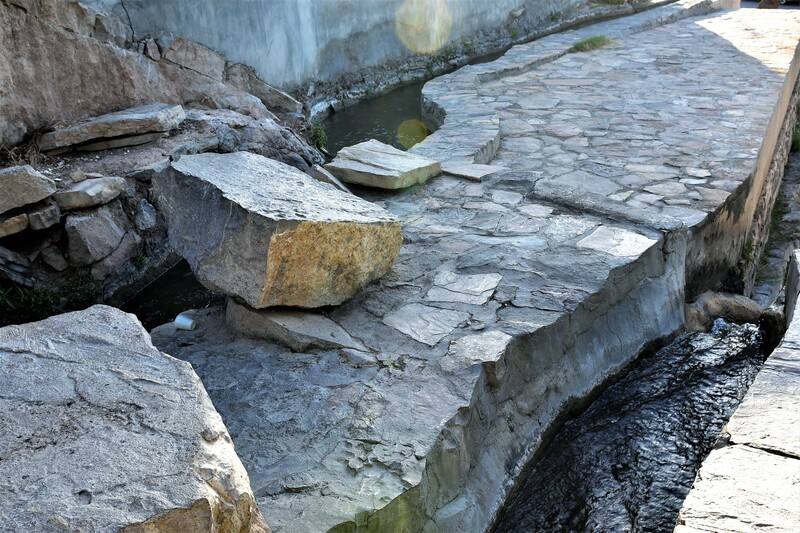 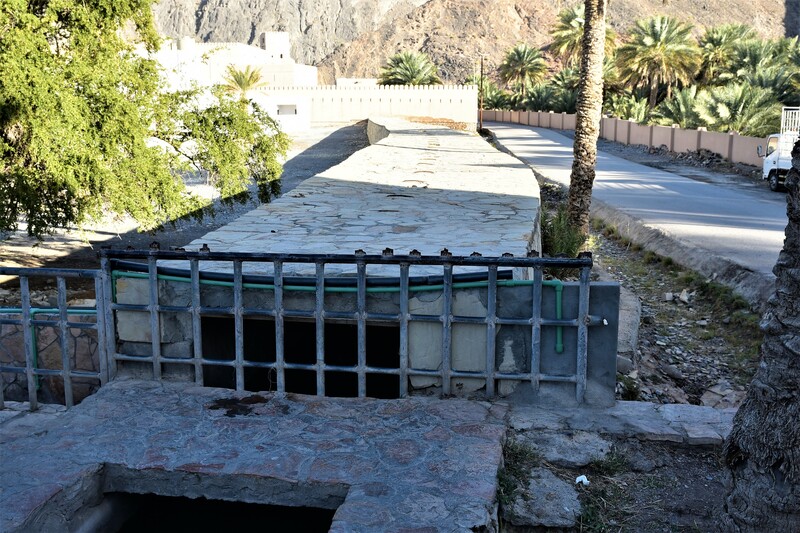 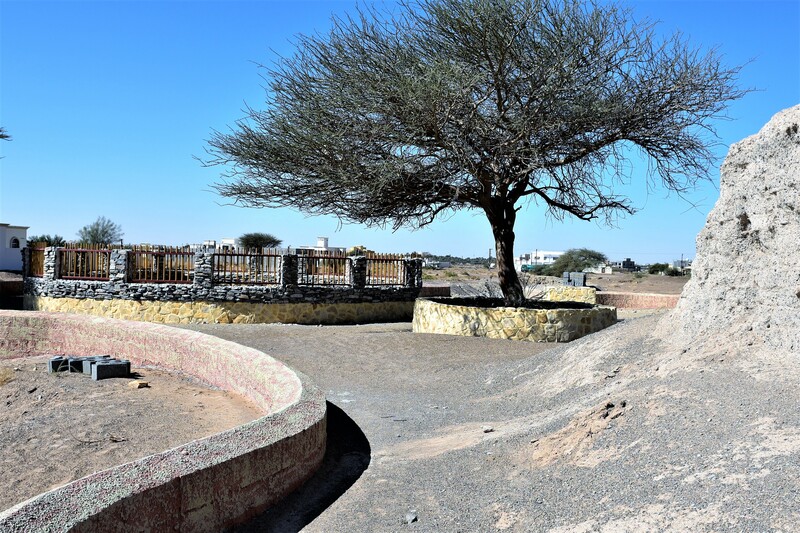 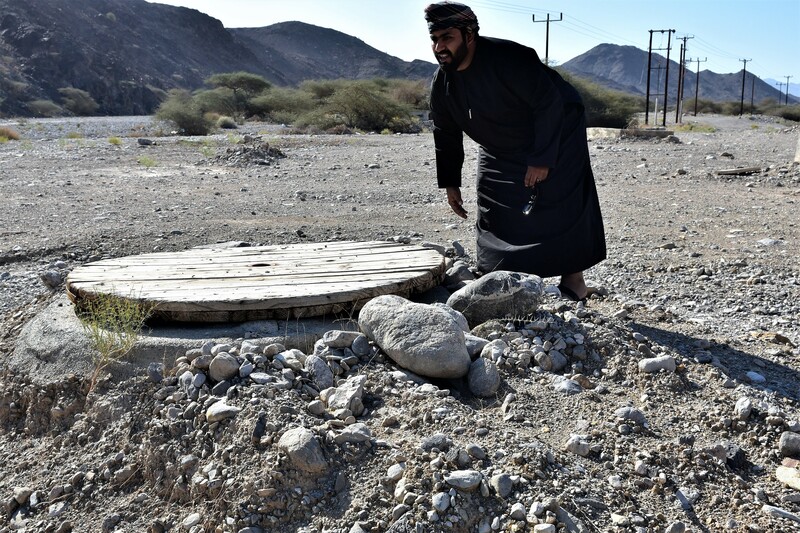 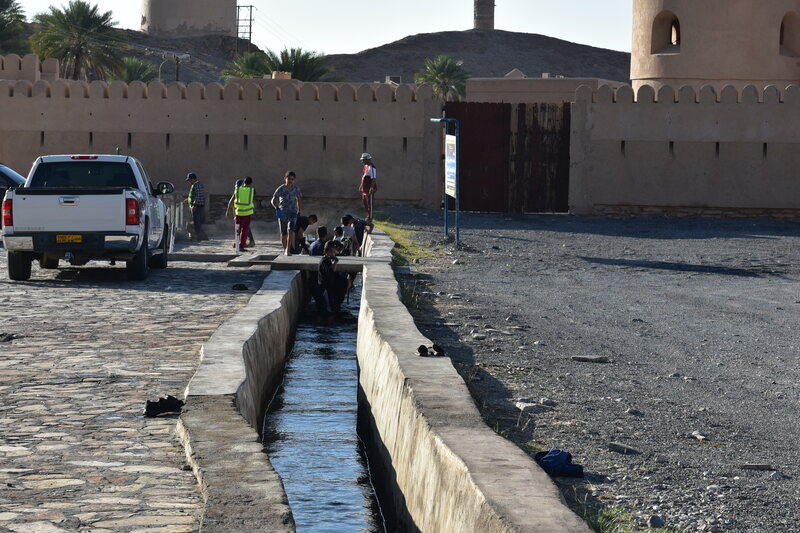 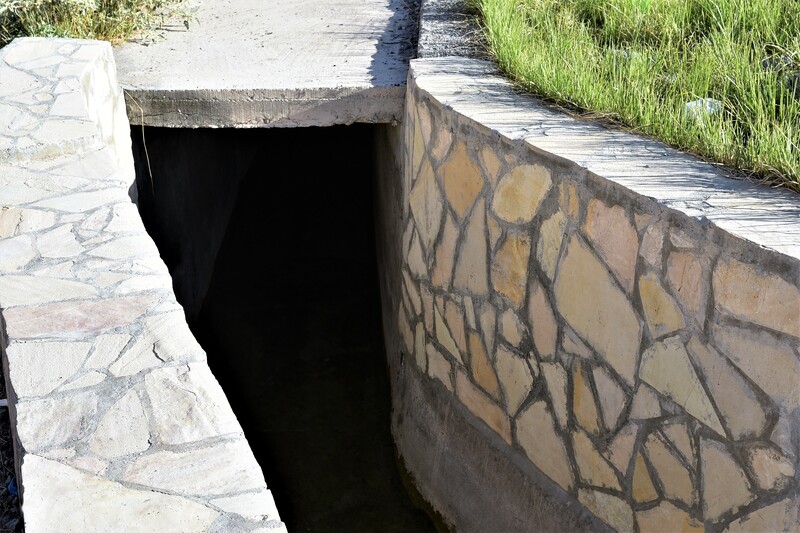 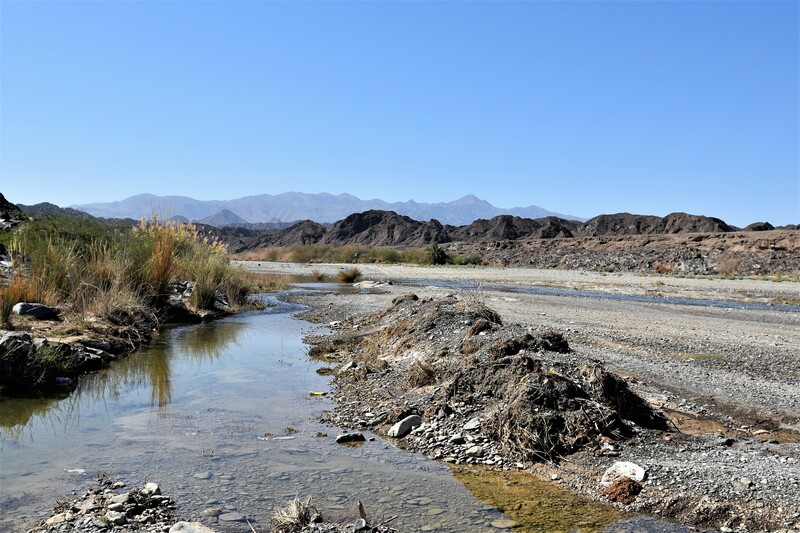 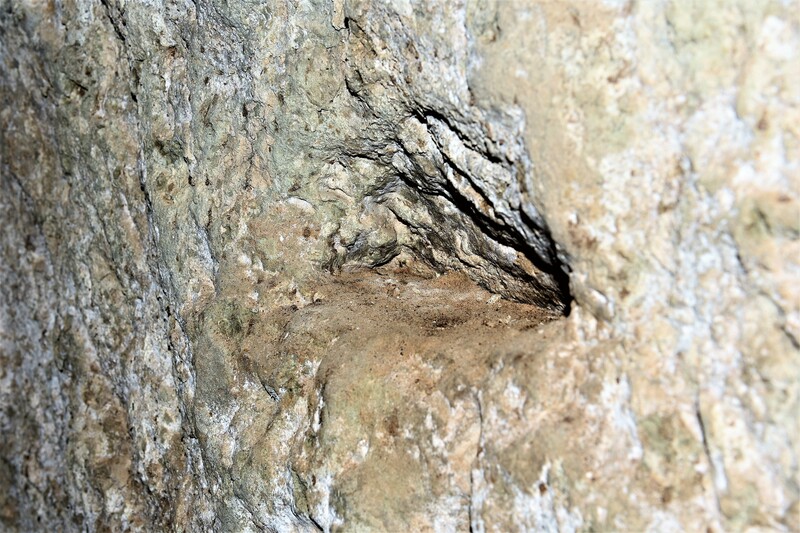 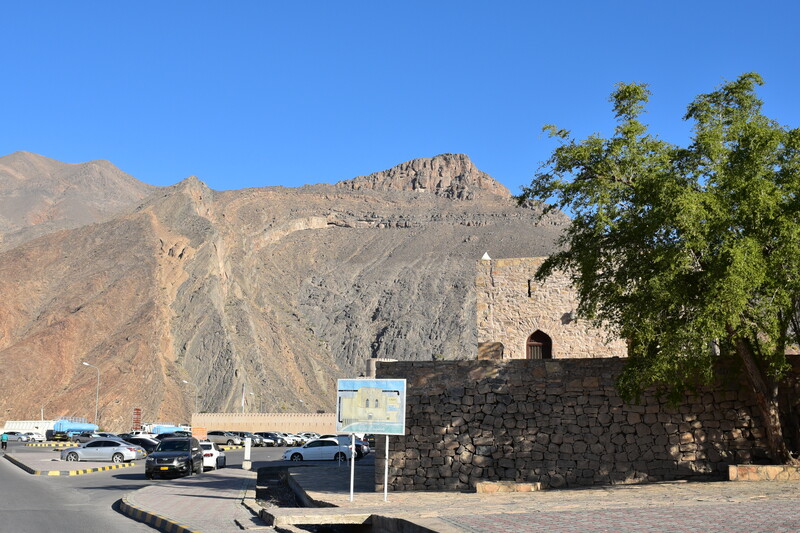 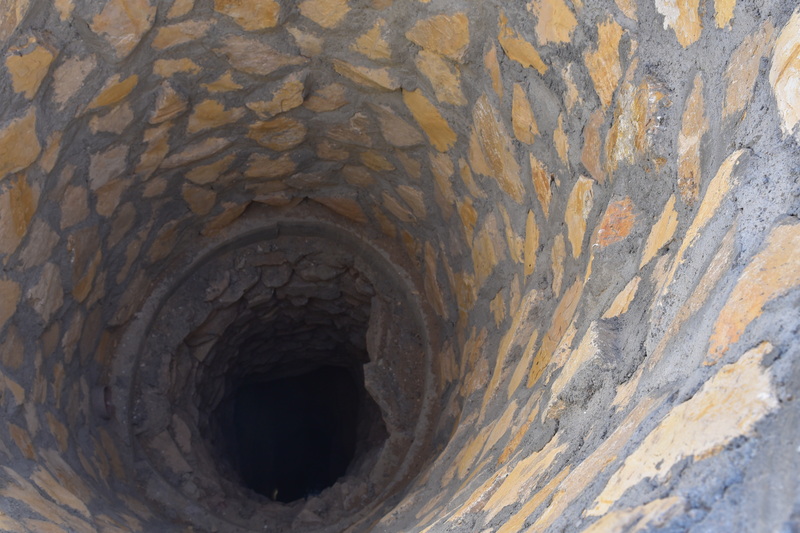 A falaj in Oman refers to water that runs through a channel dug in the earth with the source of water being groundwater. 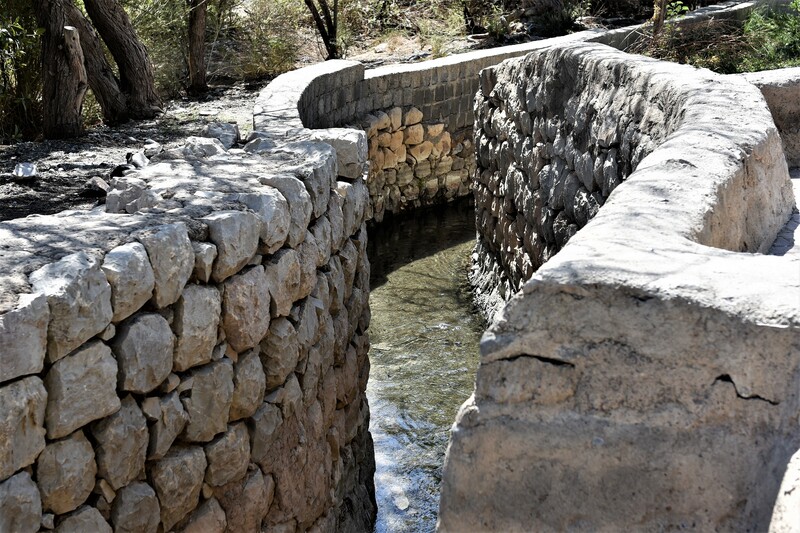 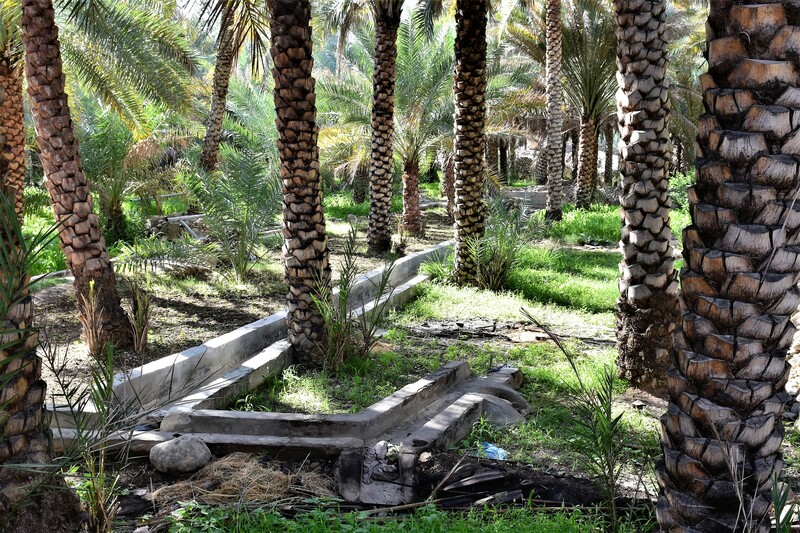 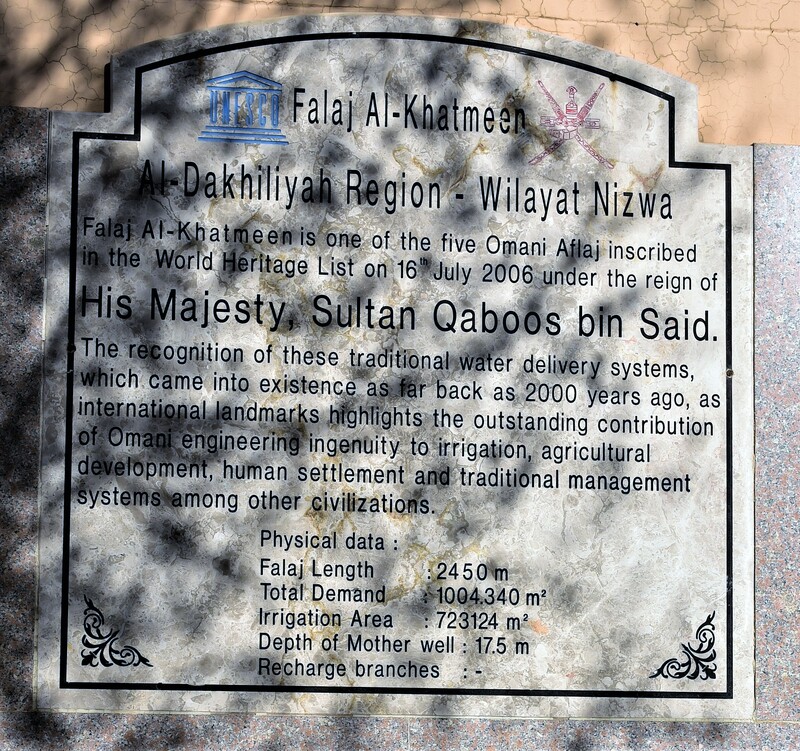 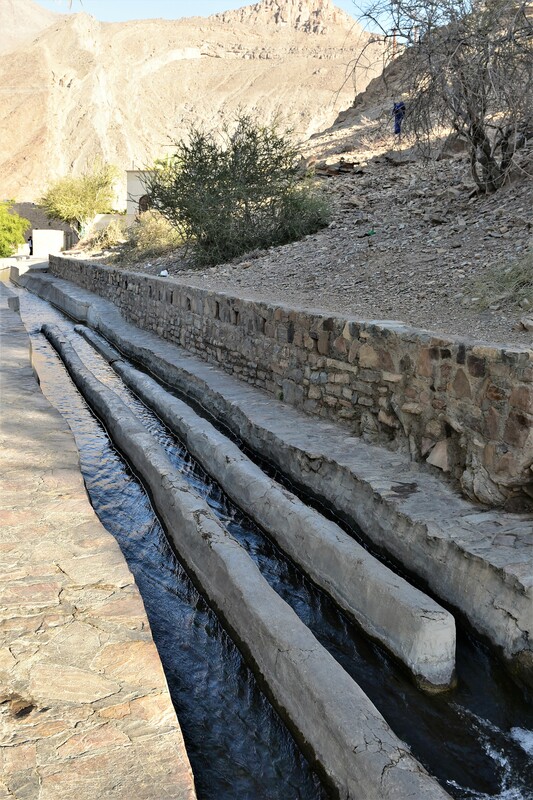 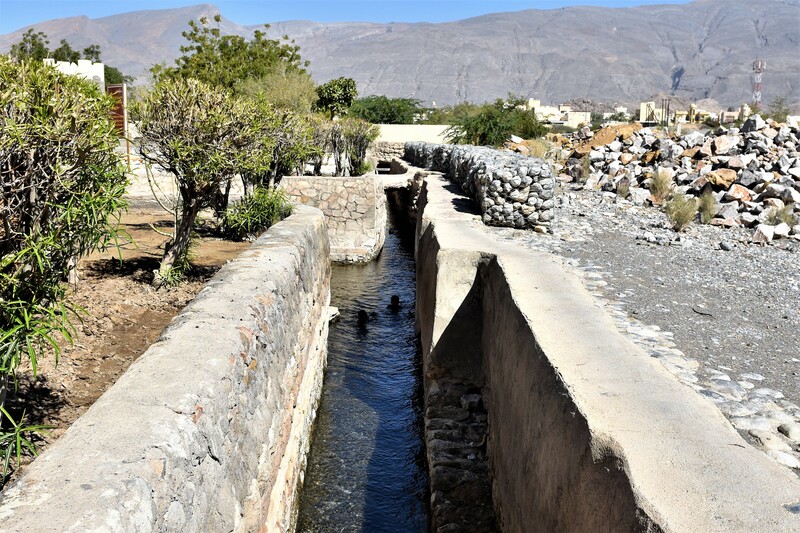 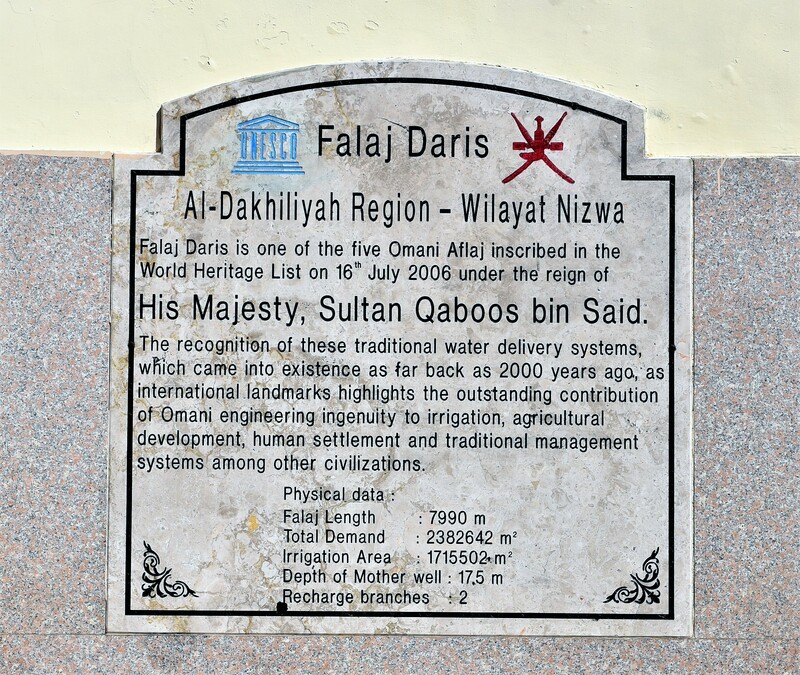 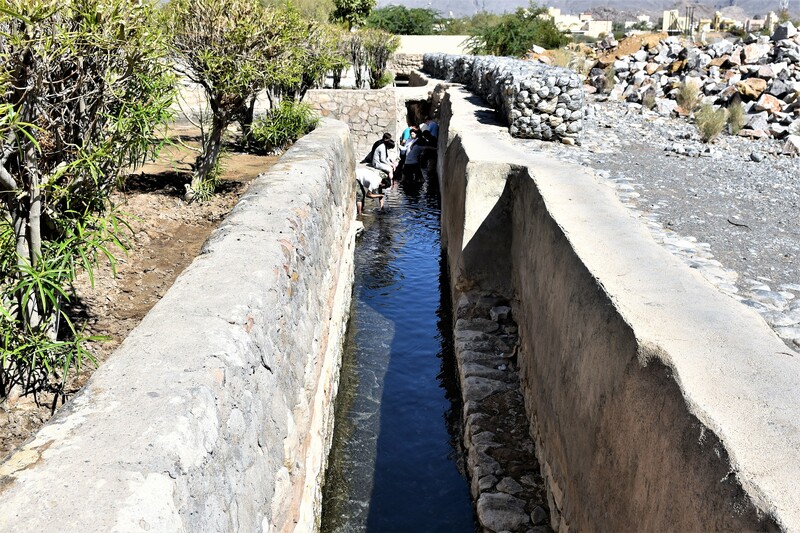 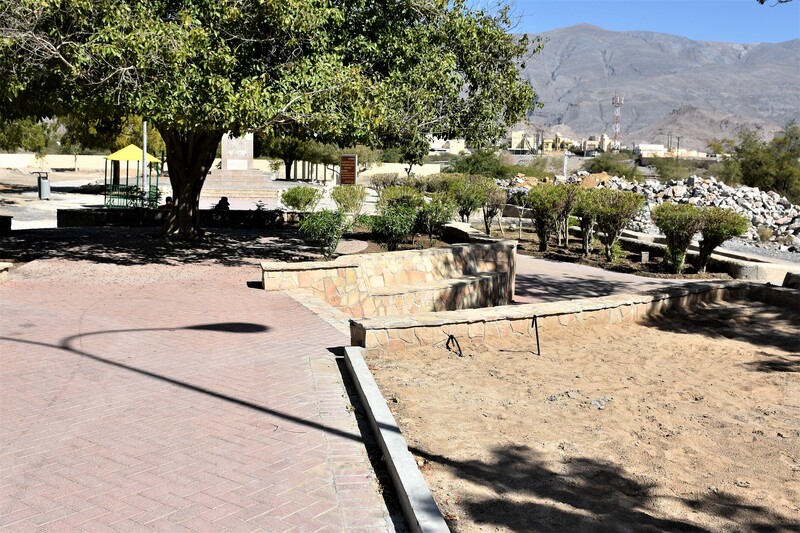 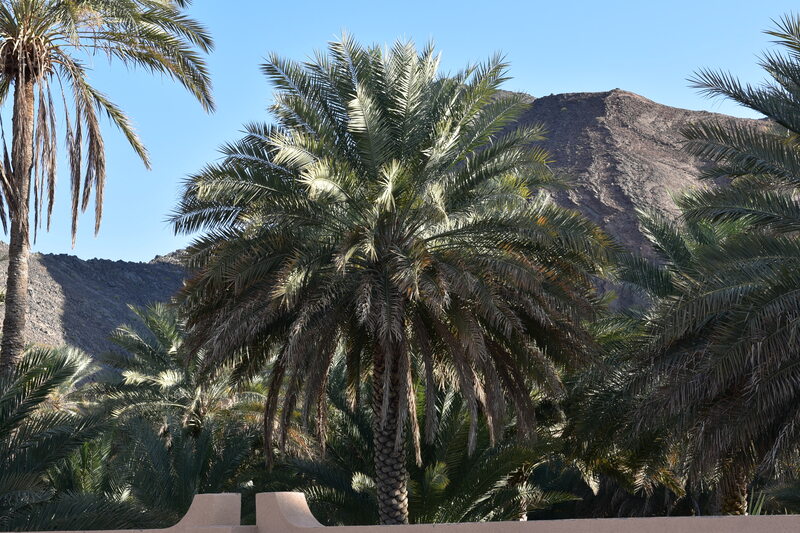 The plural of the word ‘falaj’ used in Oman is ‘aflaj’, which is a comprehensive term used to denote a system of irrigation. 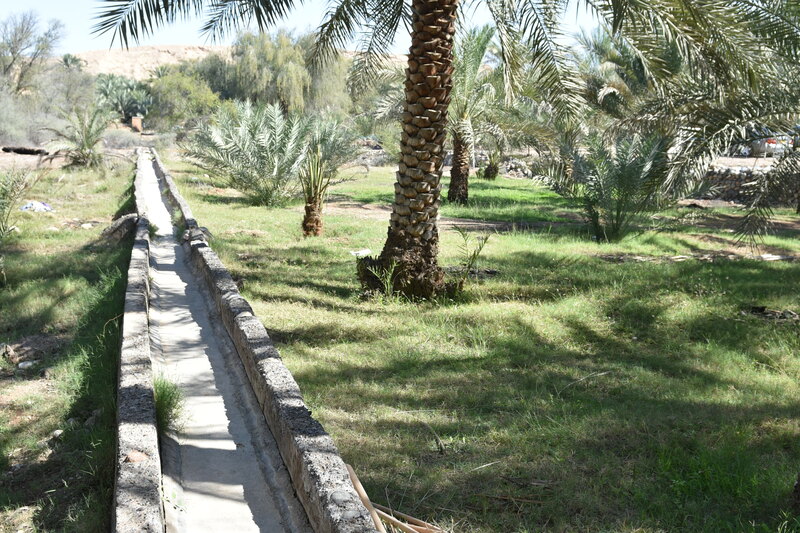 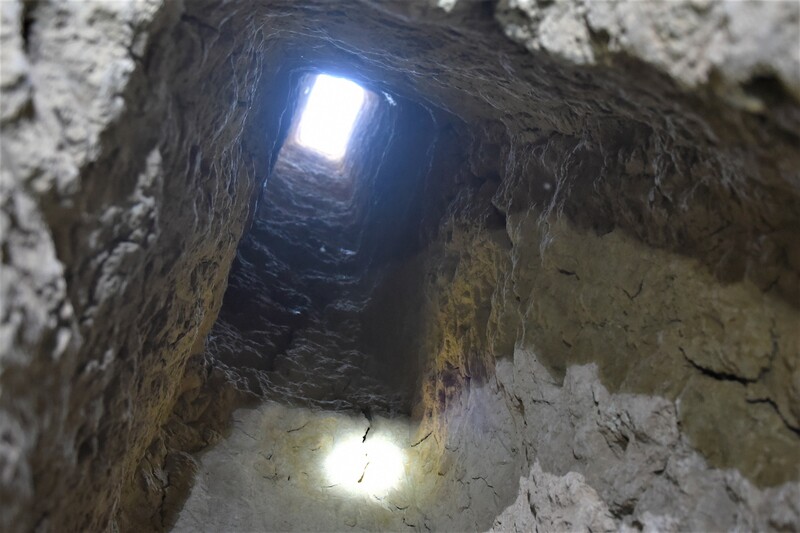 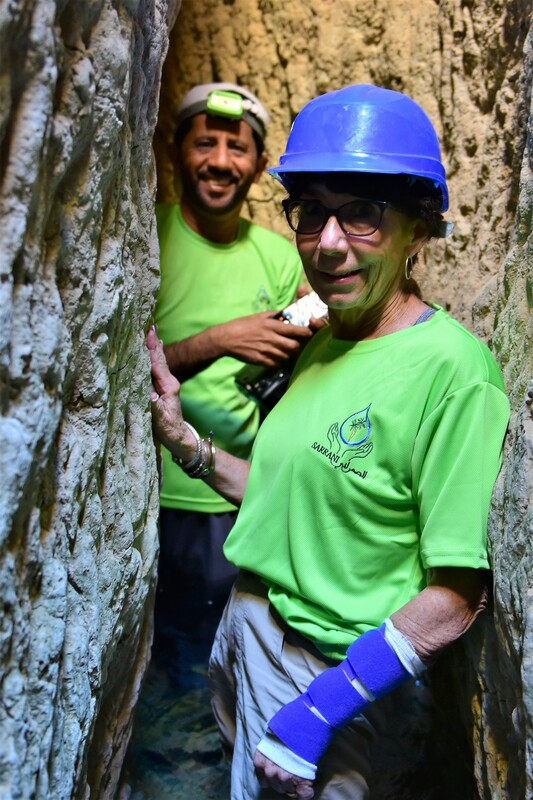 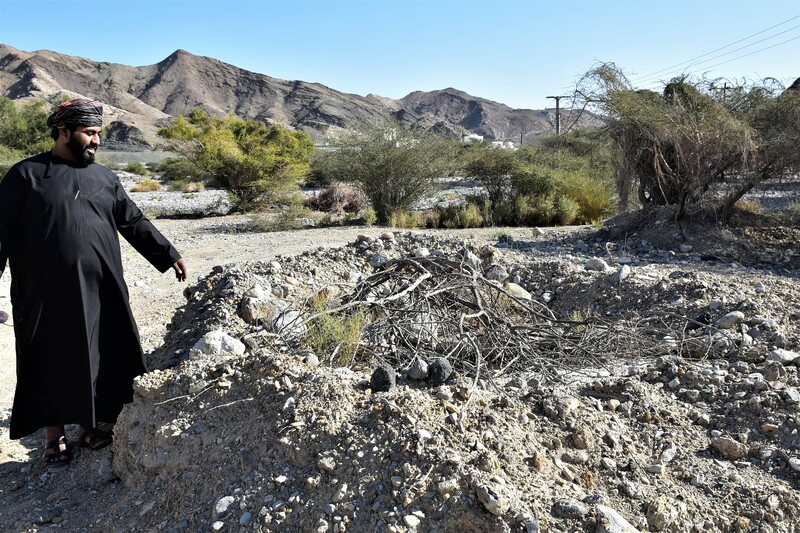 Dawoodi Falaj: These are long channels dug underground that are several kilometers long. 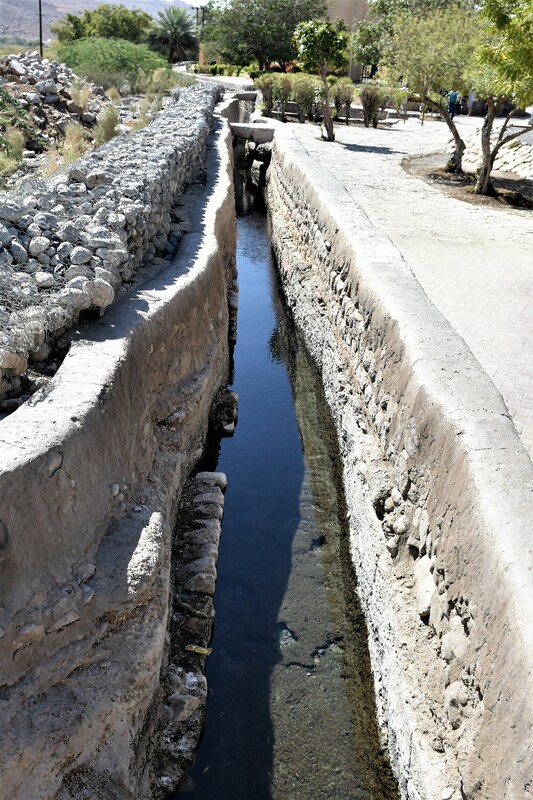 Their depth usually reaches up to tens of meters, so water can be present in these channels all year. 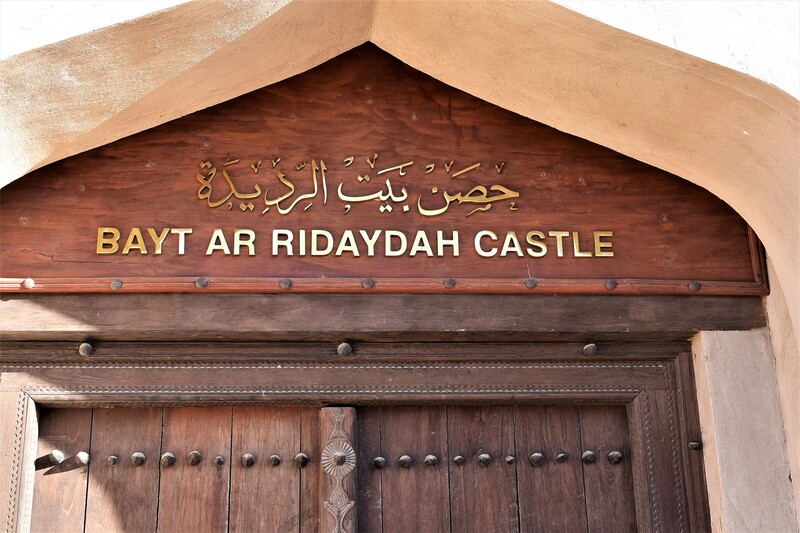 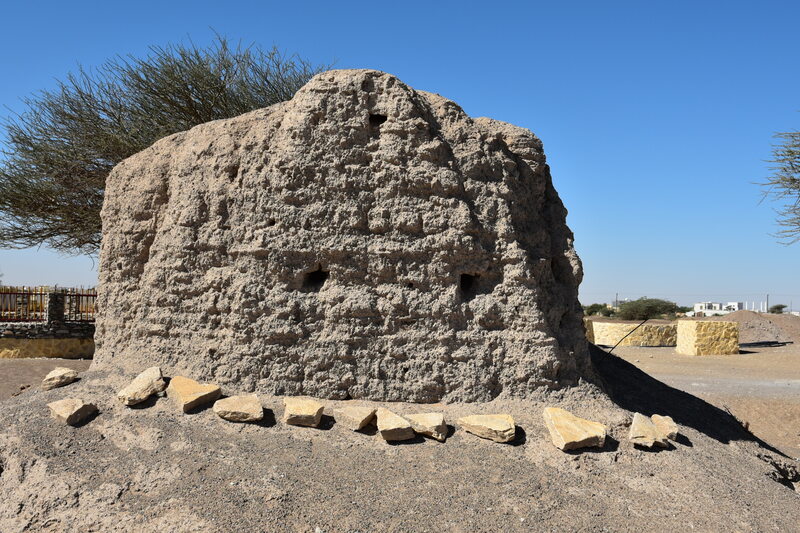 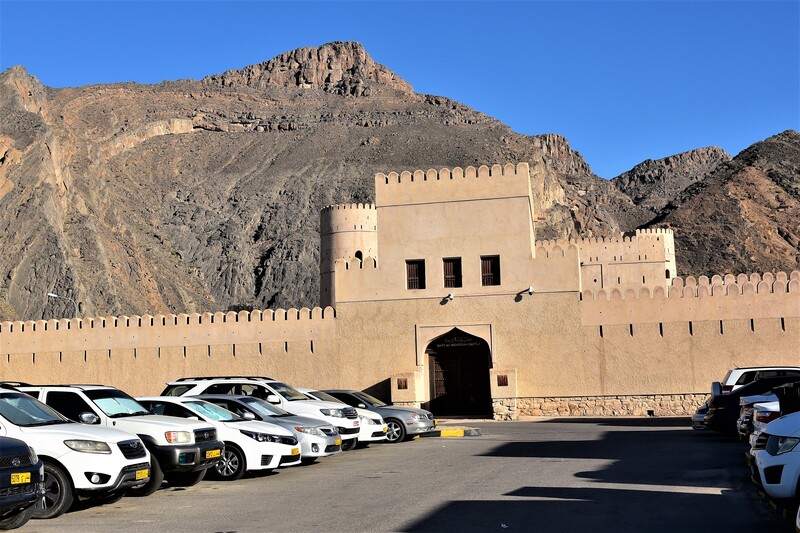 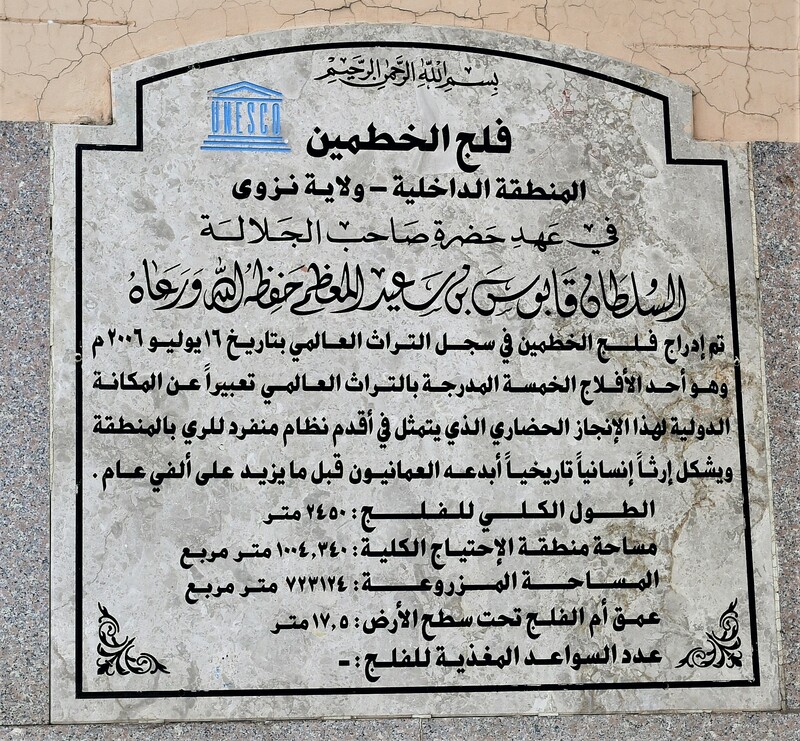 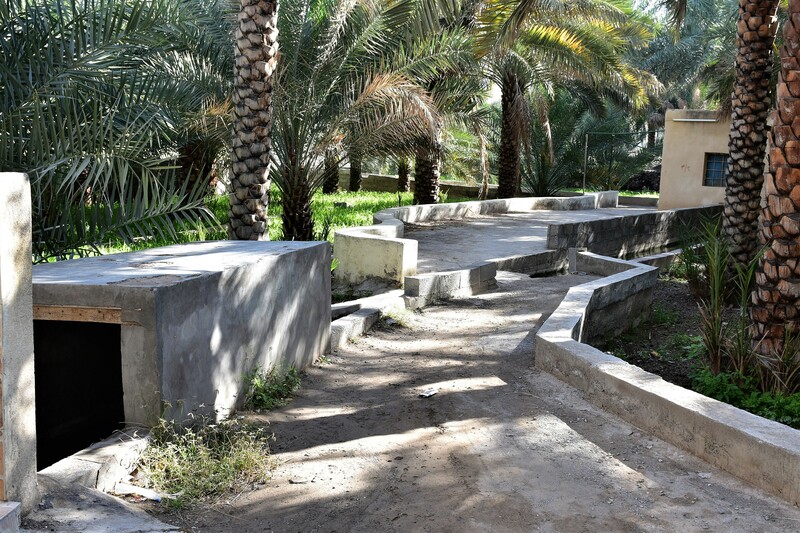 The most important of these falaj are: Falaj Al Khatmayn (or Khatmeen) and Falaj Daris in A’Dakhiliyah Governorate, which appear on the World Heritage List. 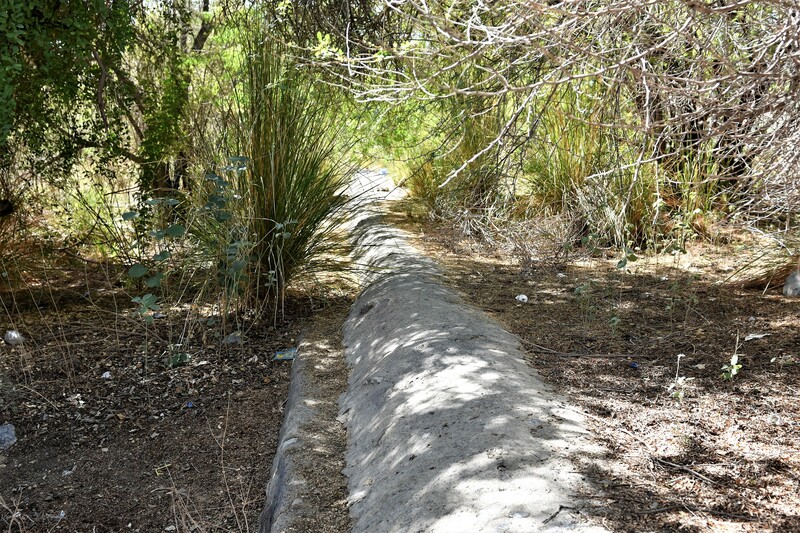 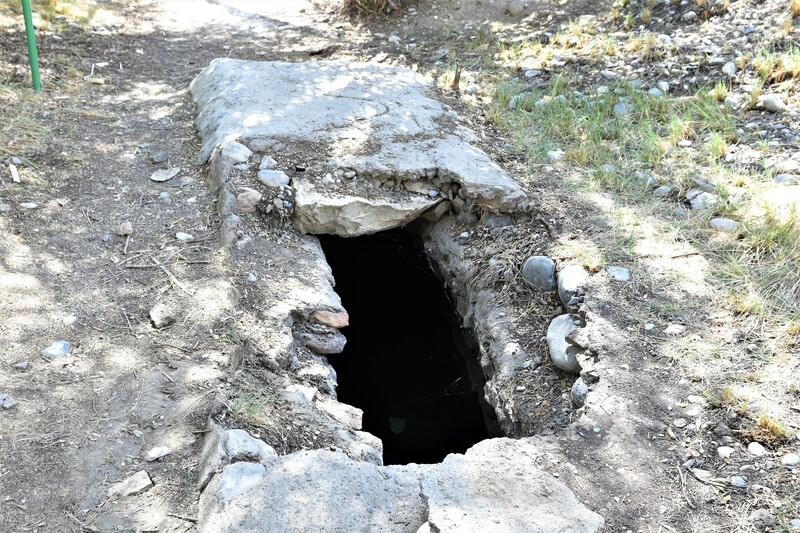 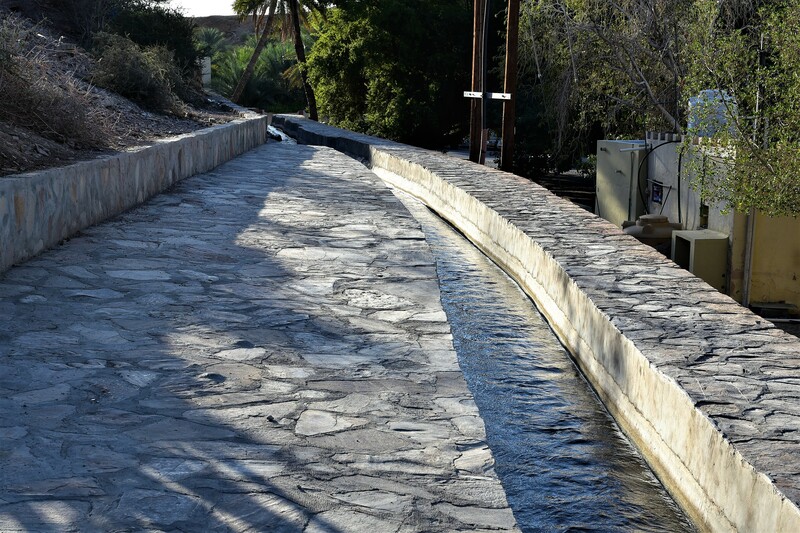 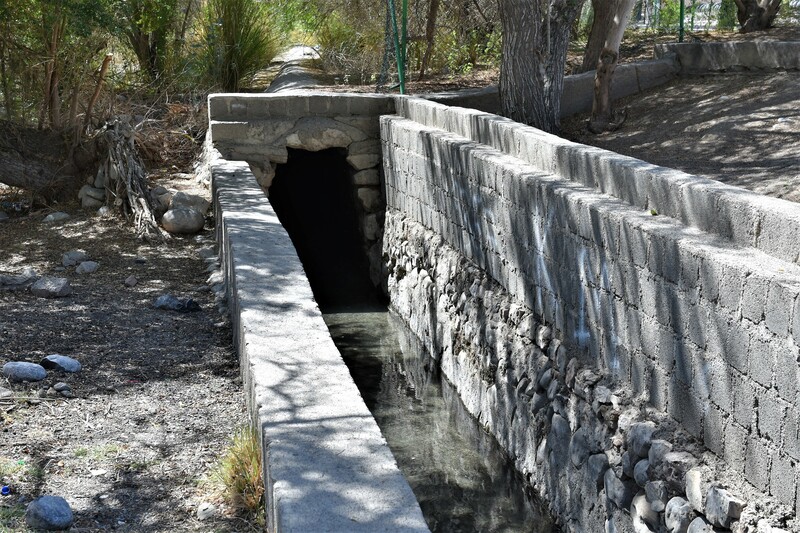 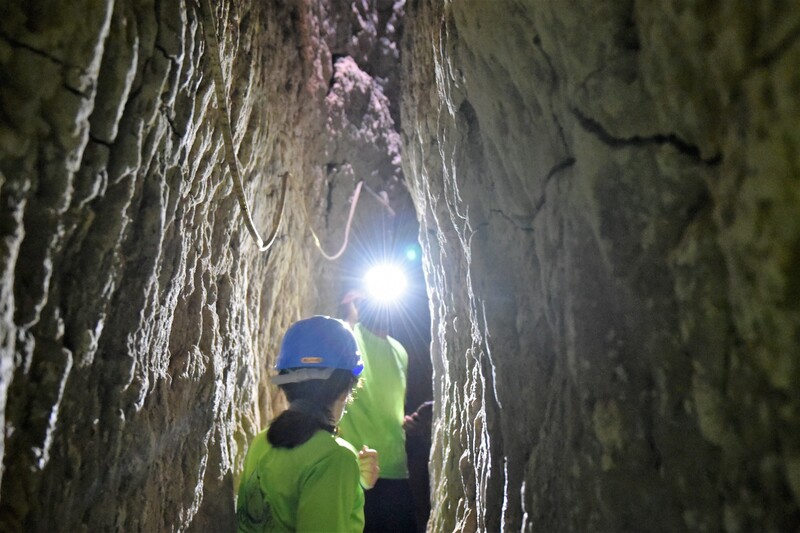 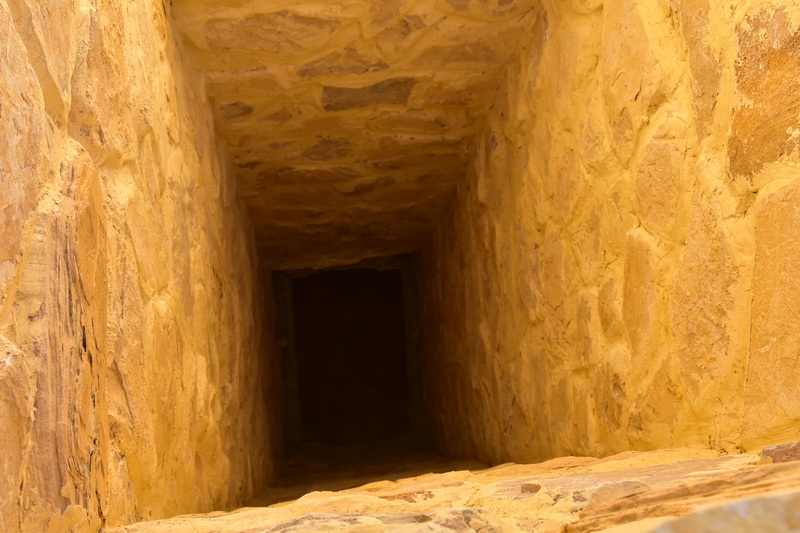 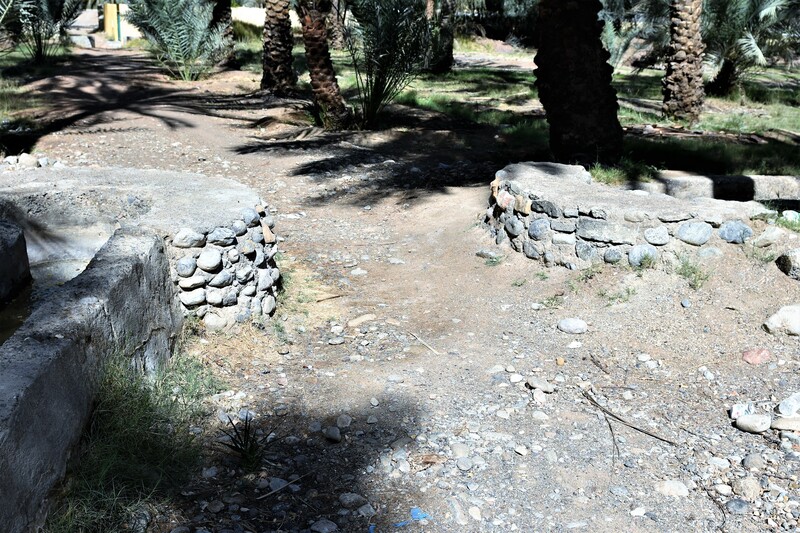 These are basically the same as the Persian qanat originating over 3,000 to 4,000 years ago. 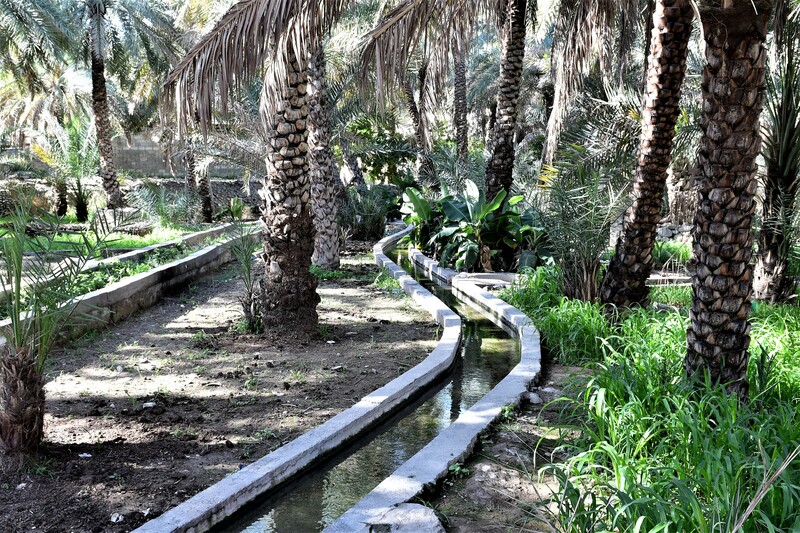 Ghaili Falaj: These falaj receive their water from ponds or running water. 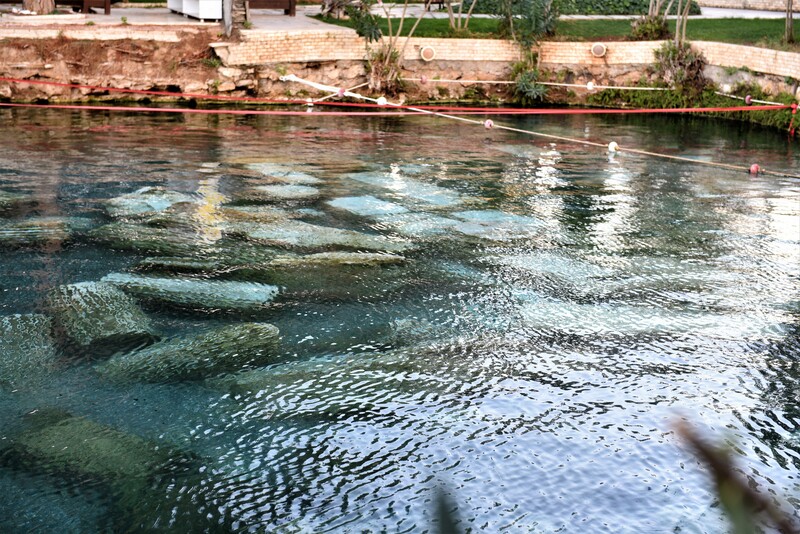 Their depths do not exceed 3 to 4 meters. 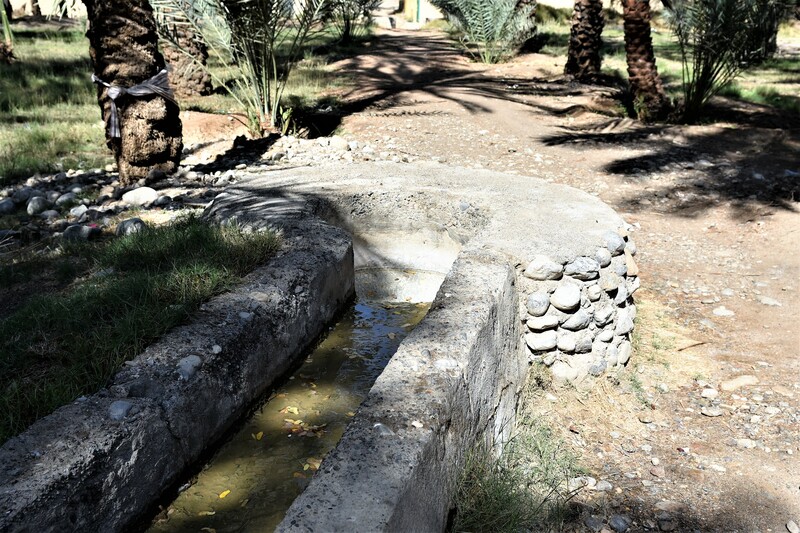 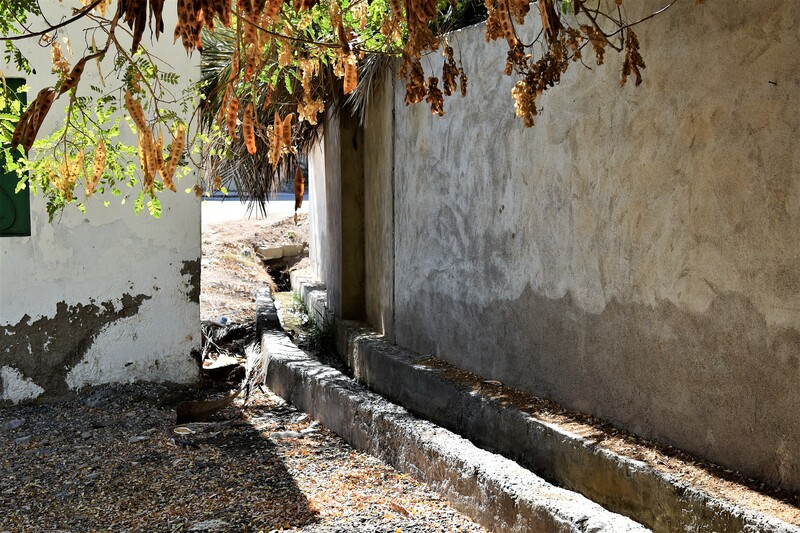 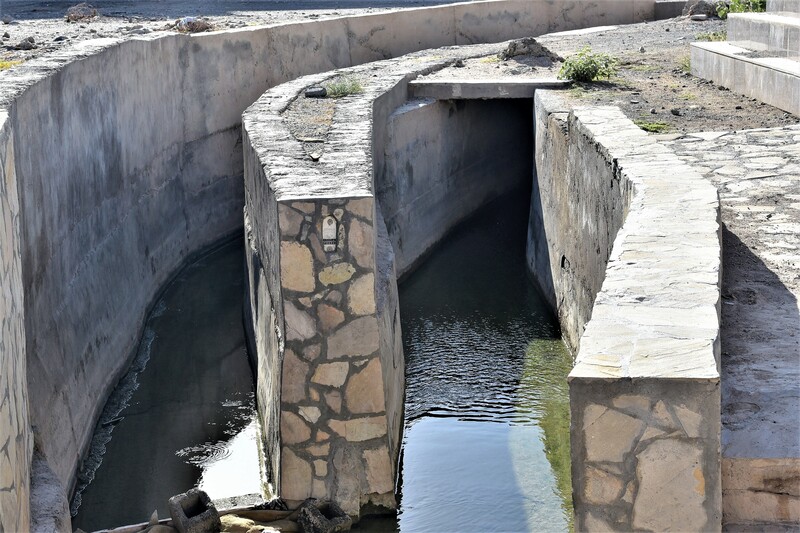 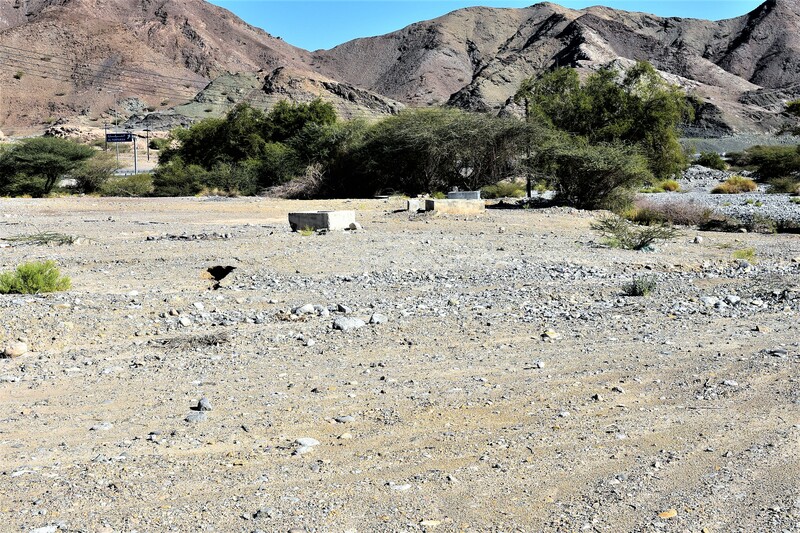 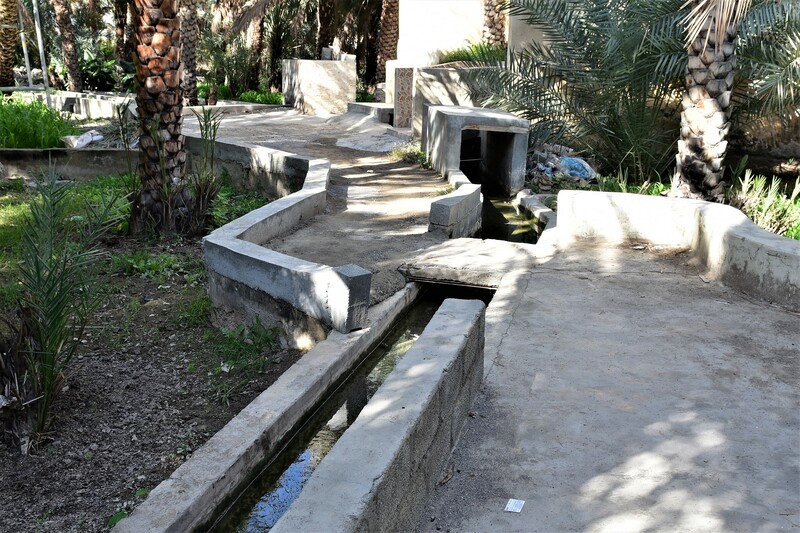 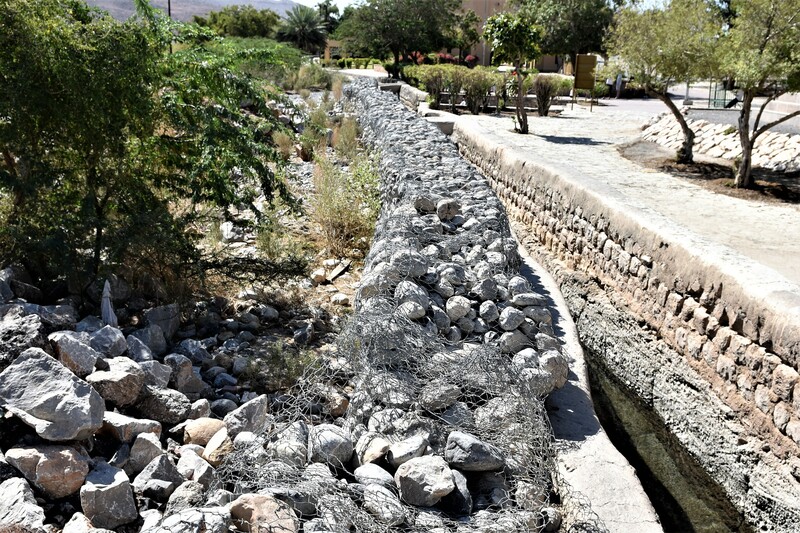 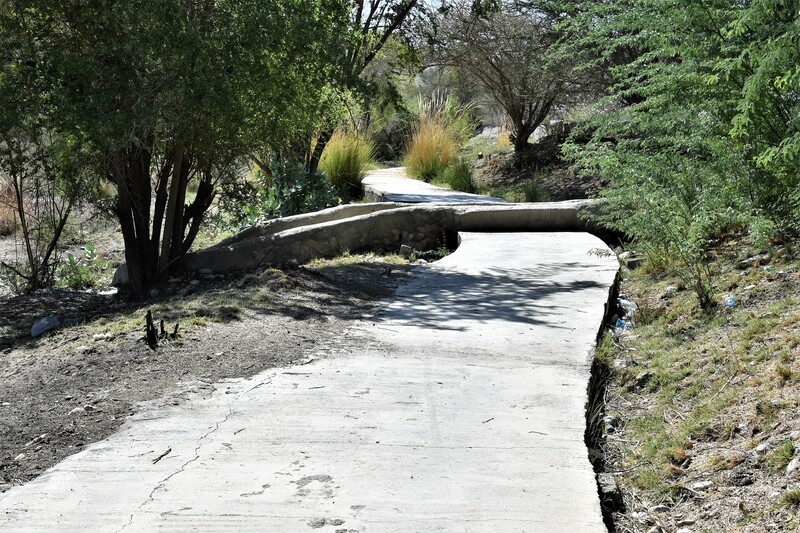 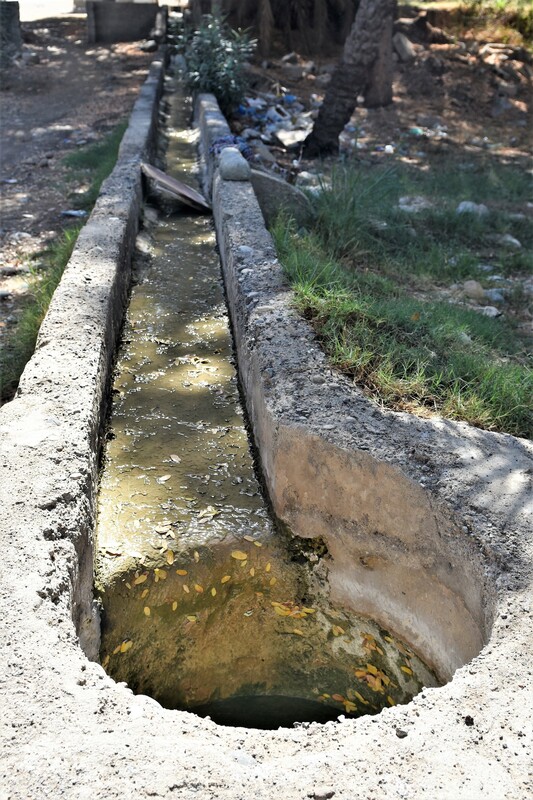 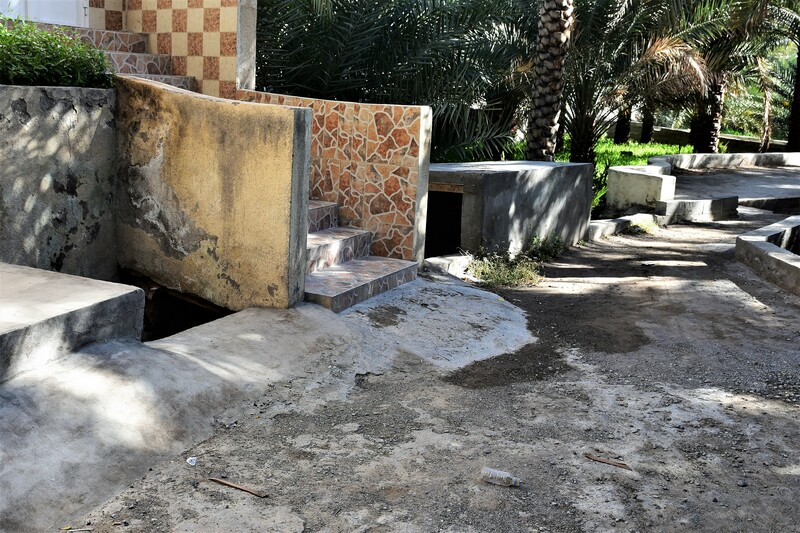 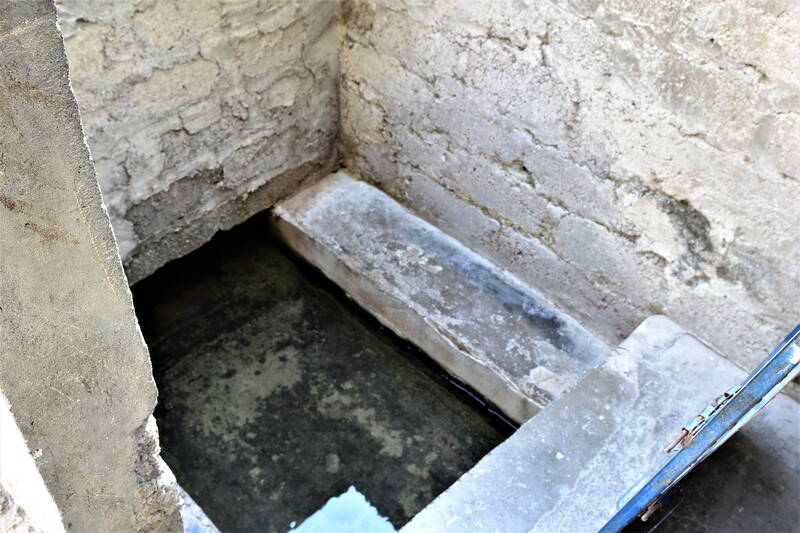 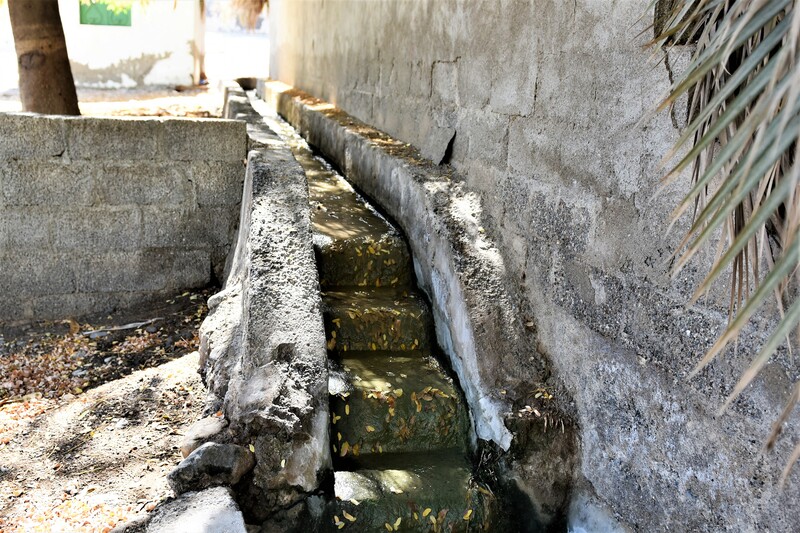 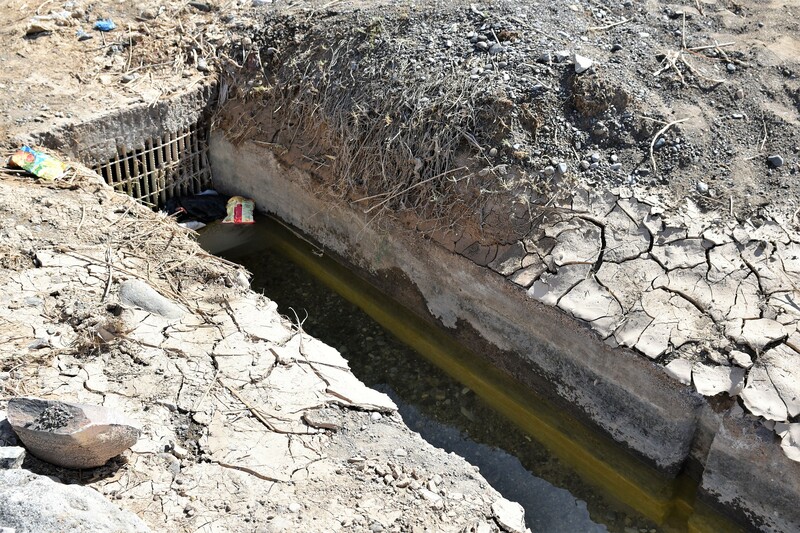 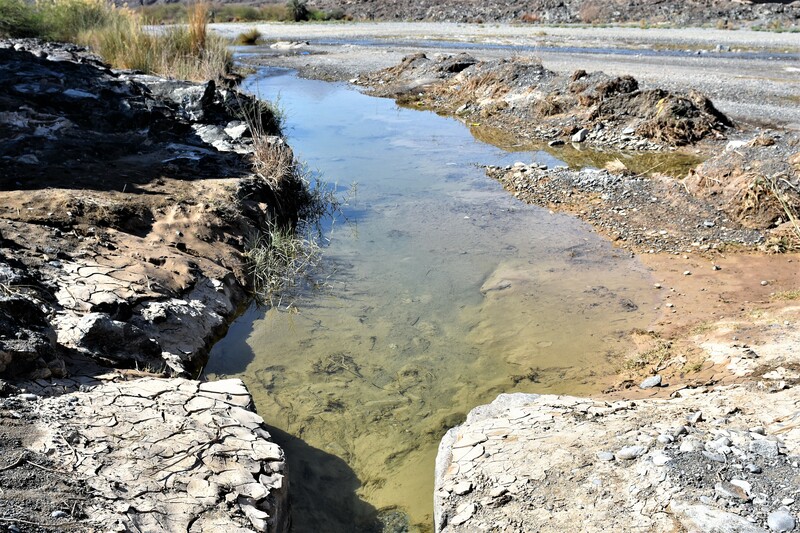 Water quantities increase in these falaj directly after rainfall and usually dry up quickly during extended dry periods. 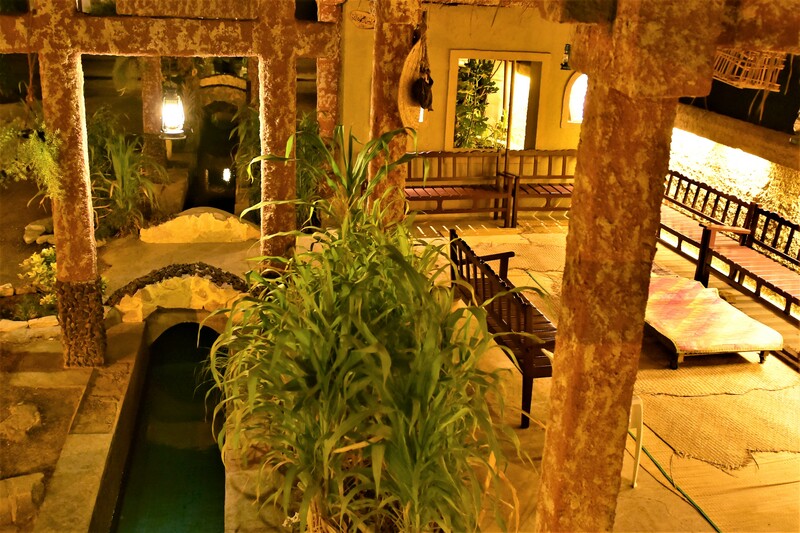 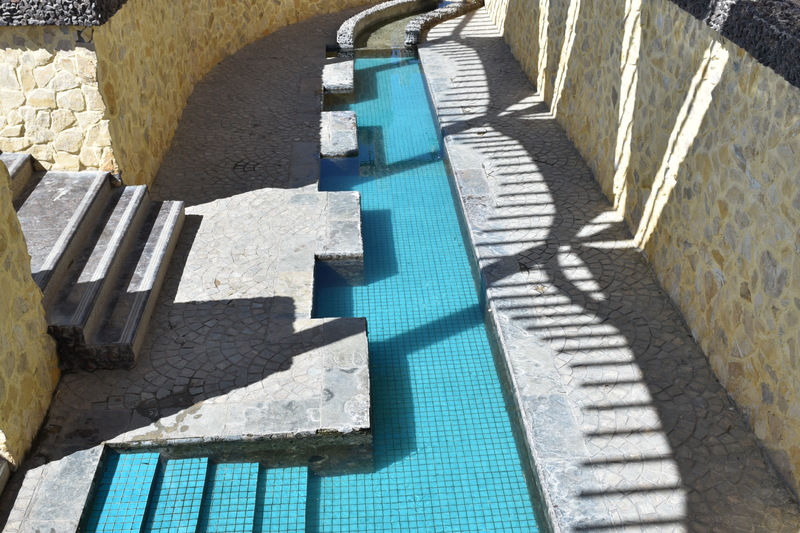 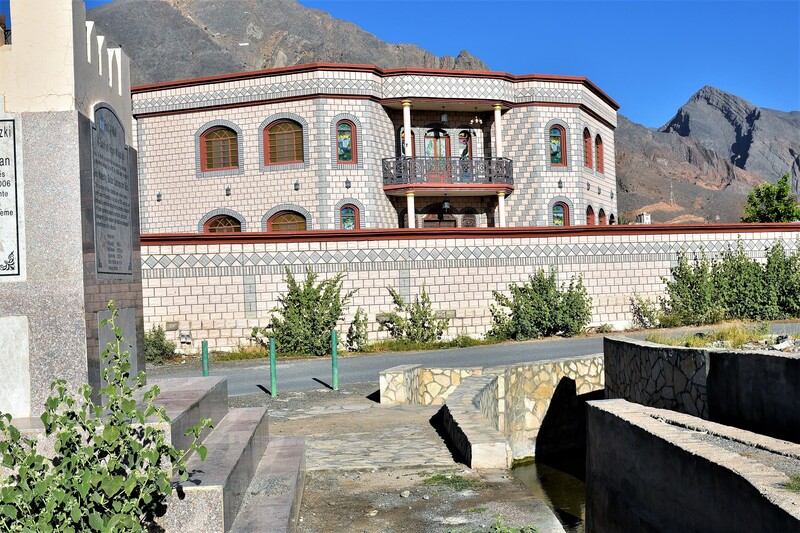 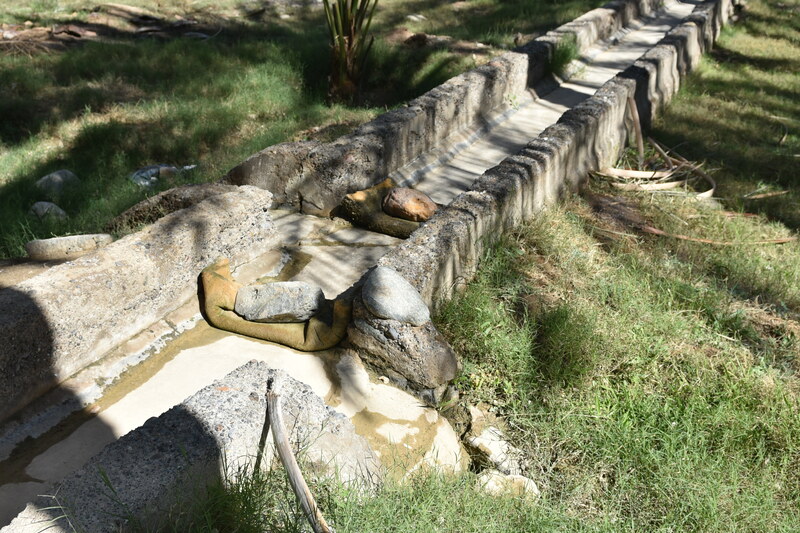 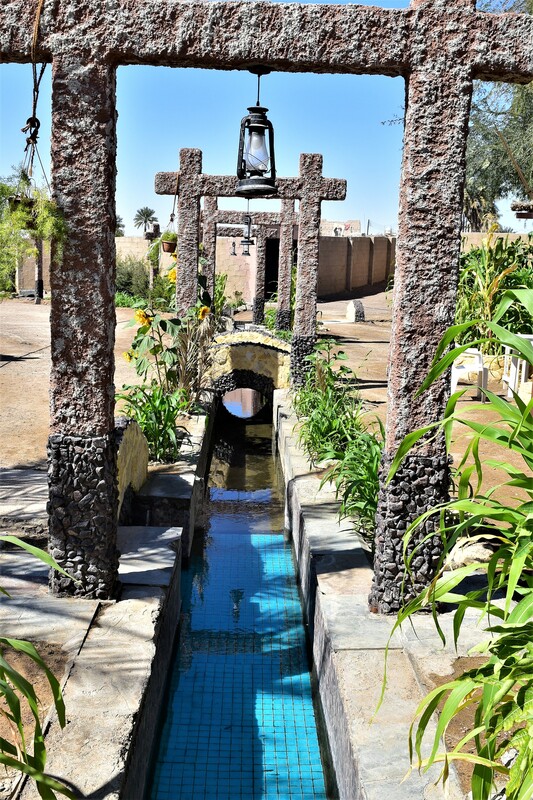 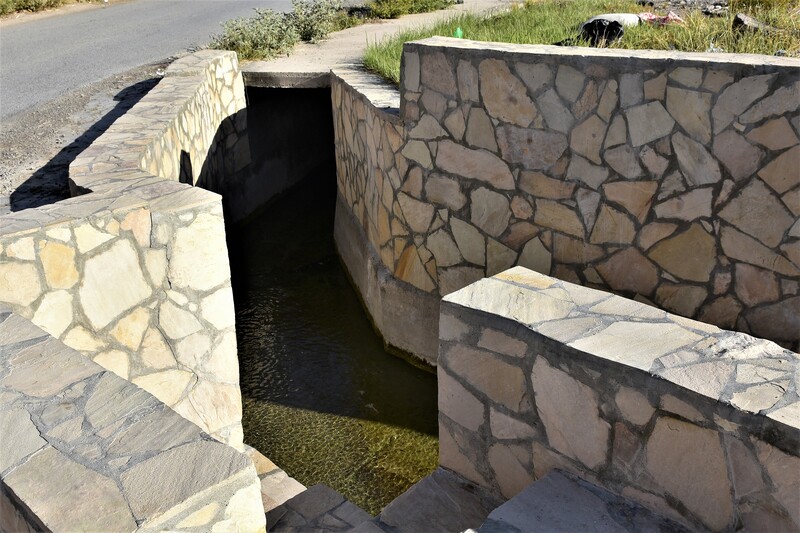 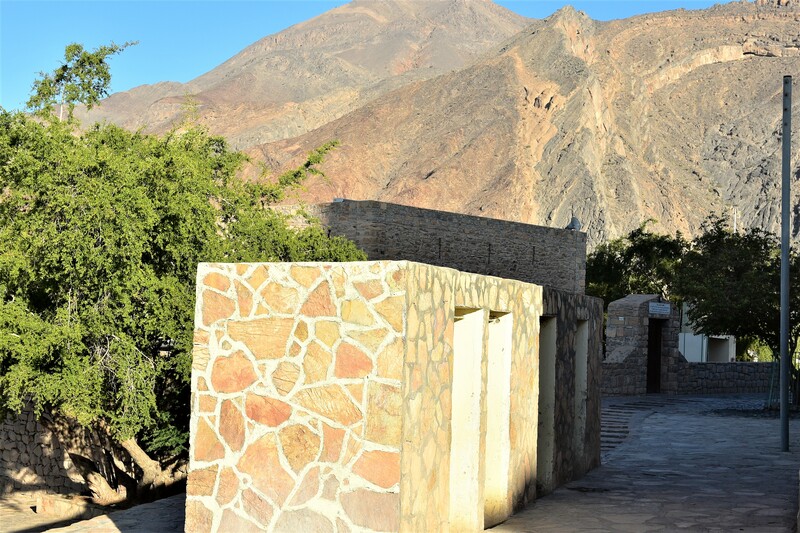 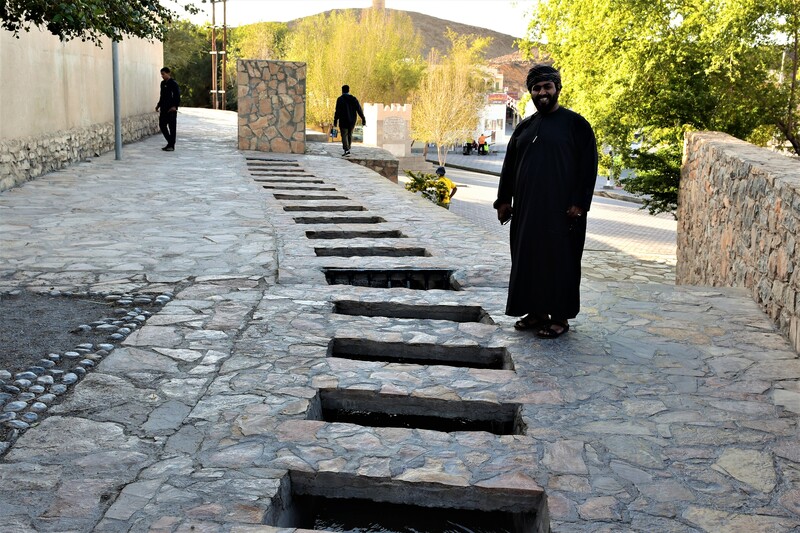 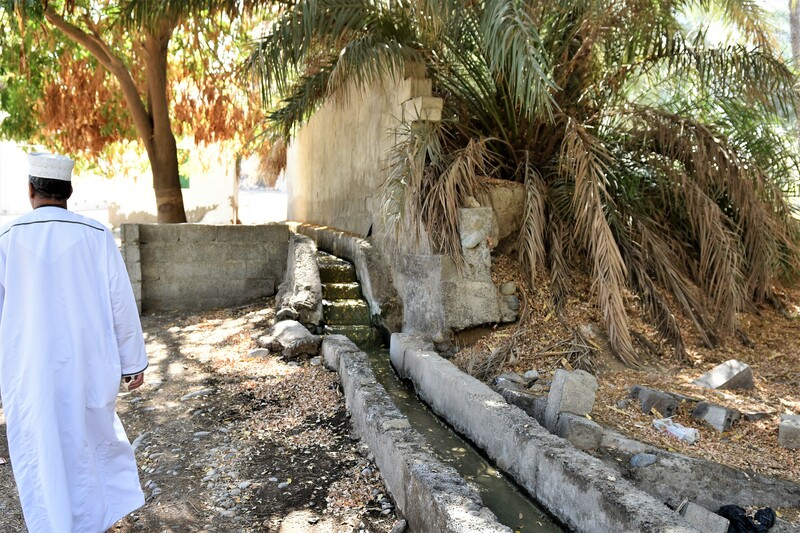 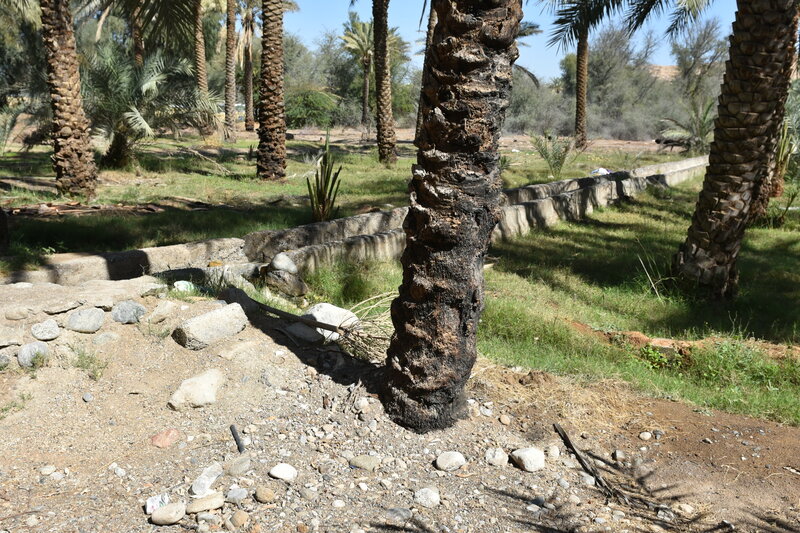 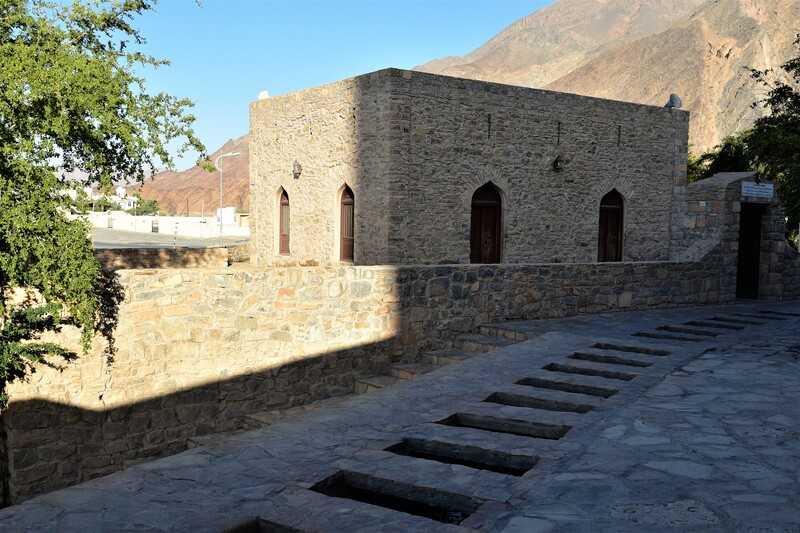 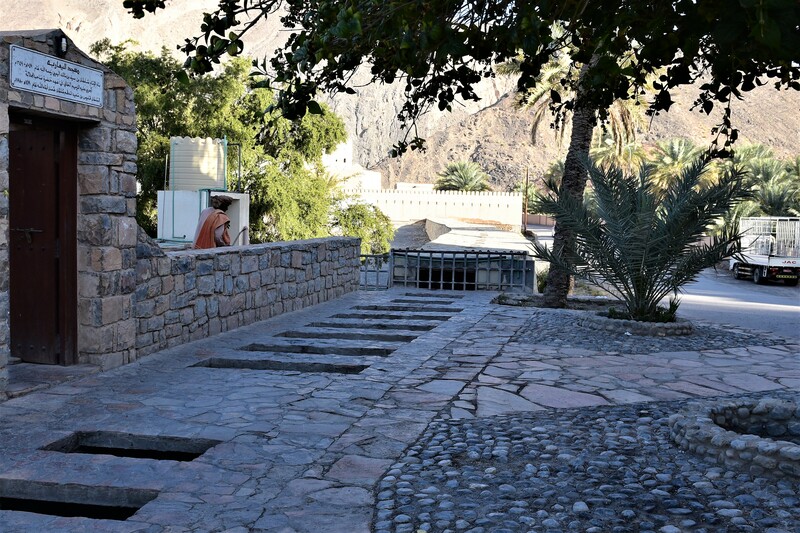 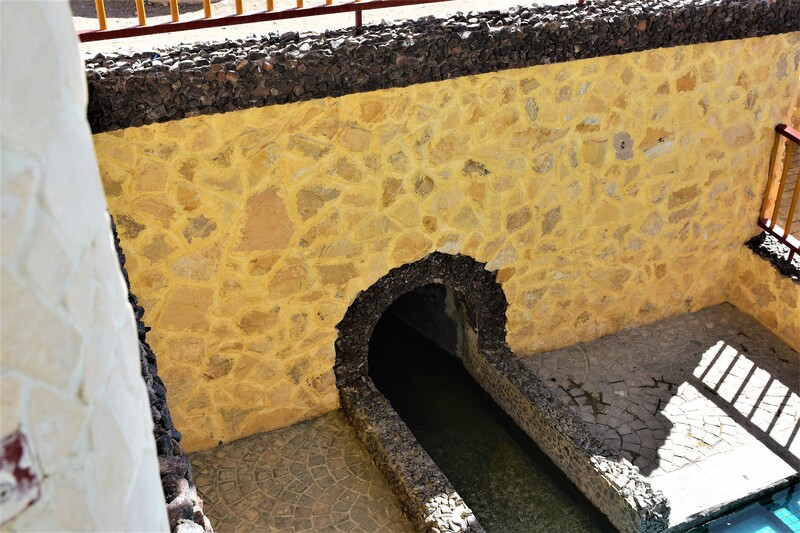 Ayni Falaj: These falaj draw their water directly from the springs (wells), including hot springs. 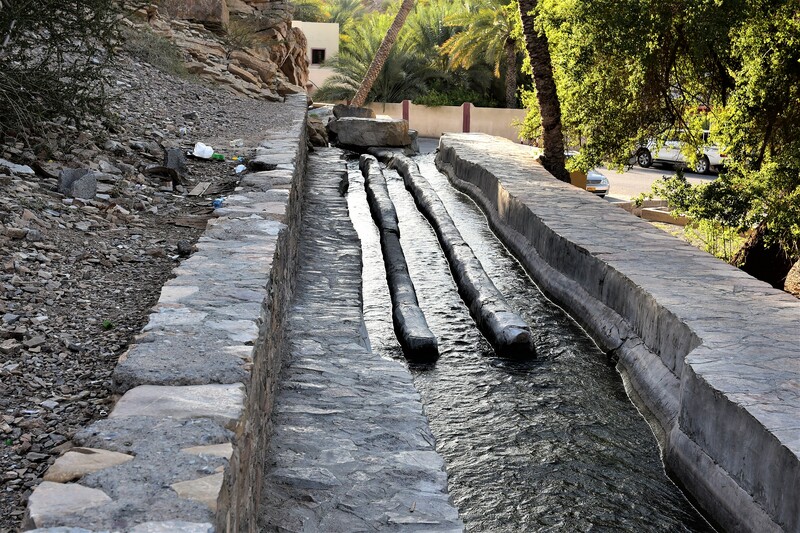 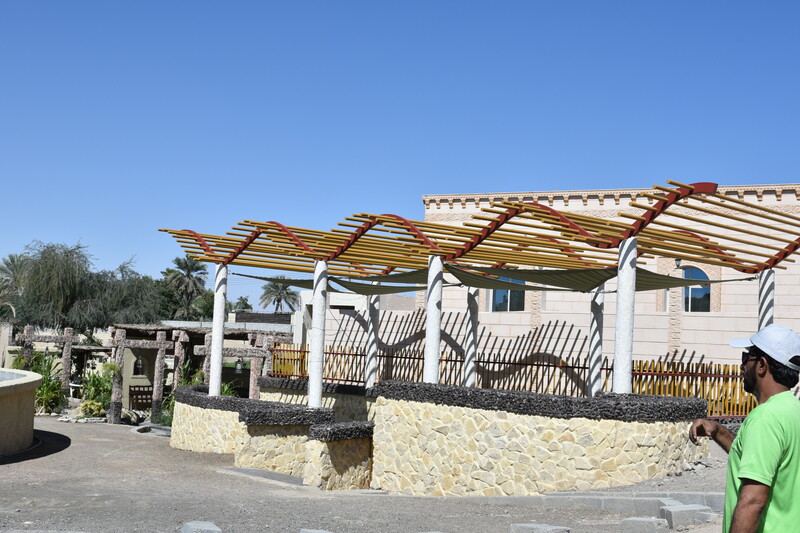 The importance of these falaj depends on their water quality, which varies between hot and cold, and between fresh drinking water, saline water, and between alkaline water mixed with valley water, considered suitable for agriculture. 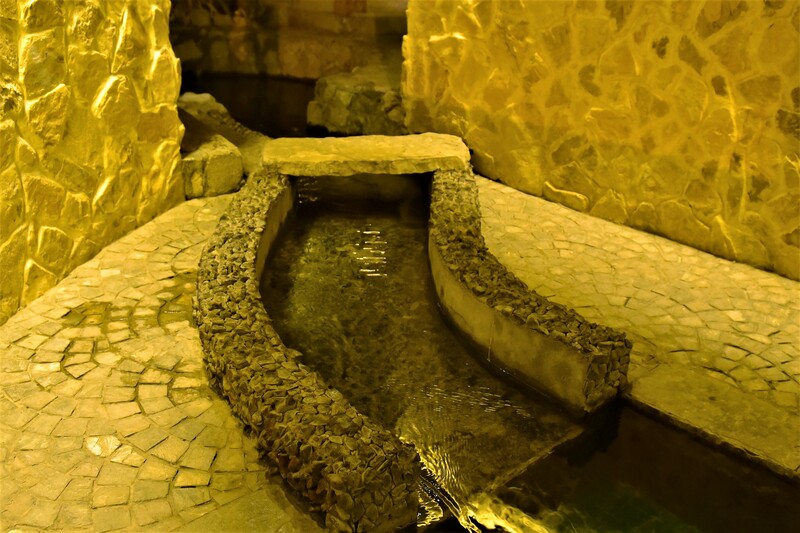 There is another kind of spring that contains varying proportions of mineral salts suitable for water treatments and therapies. 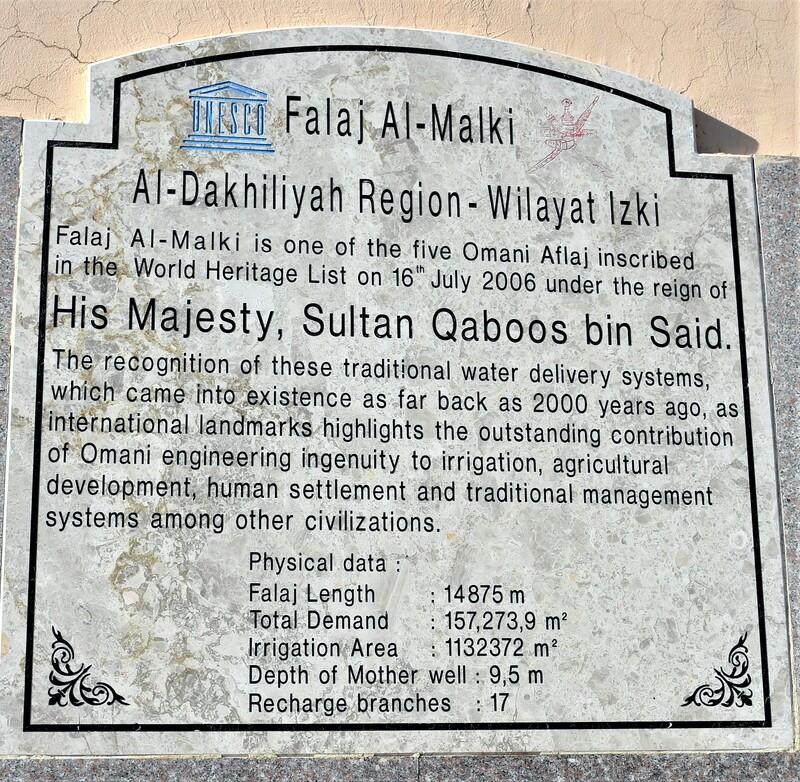 Source: Abdullah Al-Ghafri, Study on Water Distribution Management of Aflaj Irrigation Systems of Oman, Ph.D. Dissertation, Hokkaido University, Sapporo, Japan, March 2004. 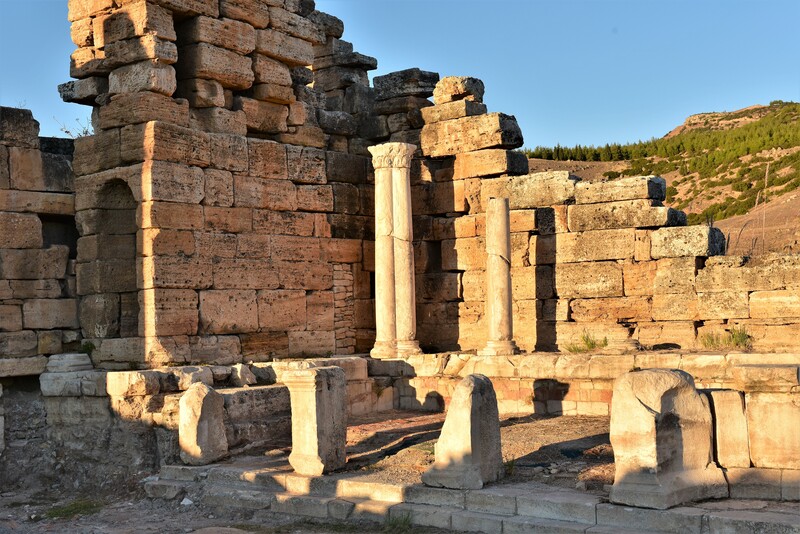 Stratonikeia is located in the Yatagan district of the Mugla province at the Eskihisar Village. 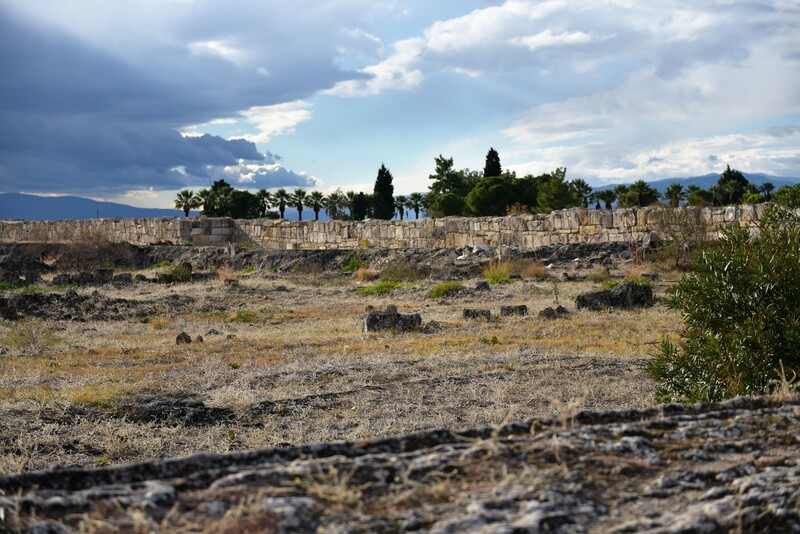 Stratonikeia has been inhabited continuously from the Late Bronze Age (1500 BC) to the present. 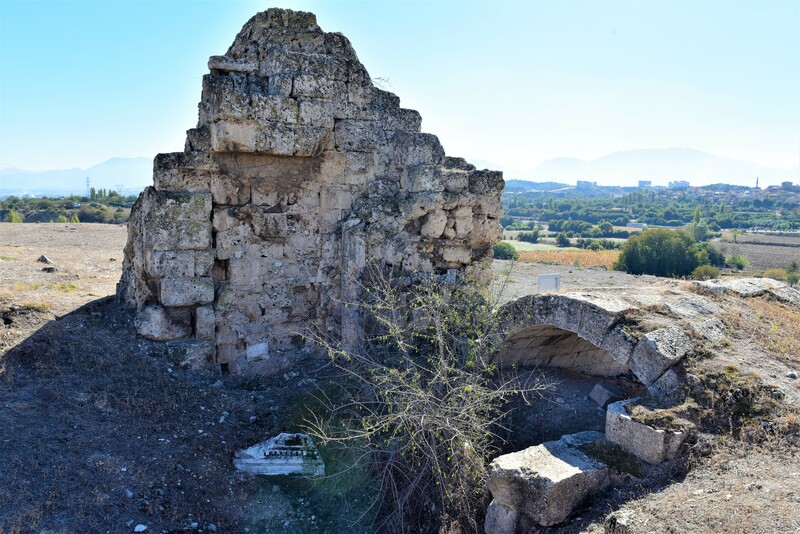 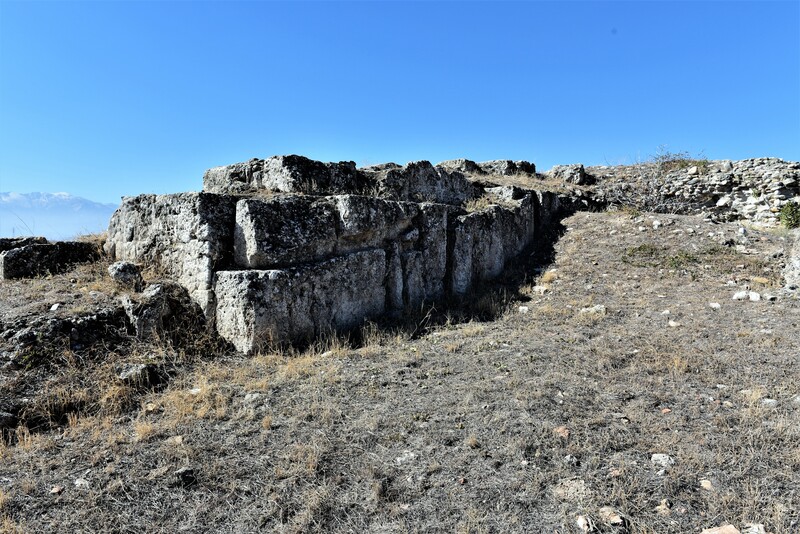 The name of the settlement was Atriya during the Hittite Period, Khrysaoris and Idrias during the Classical Period and Stratonikeia during the Hellenistic Period. 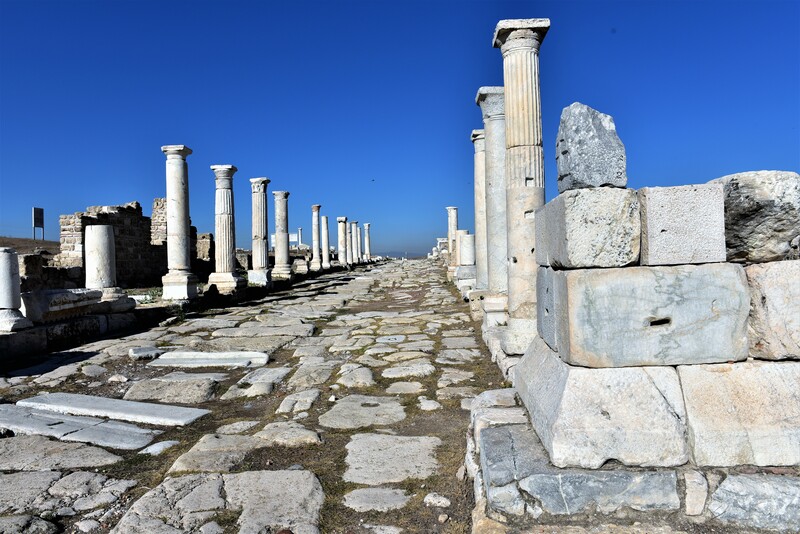 In 130/129 BC the region became a part of the Roman Republic Empire. 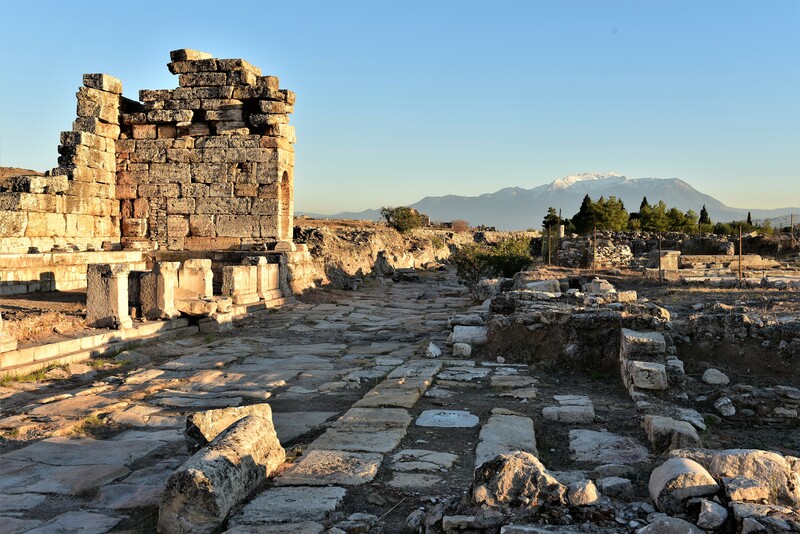 From the Early Byzantine Period The population started to decrease in the Early Byzantine period and during the Middle Byzantine period continued to shrink. 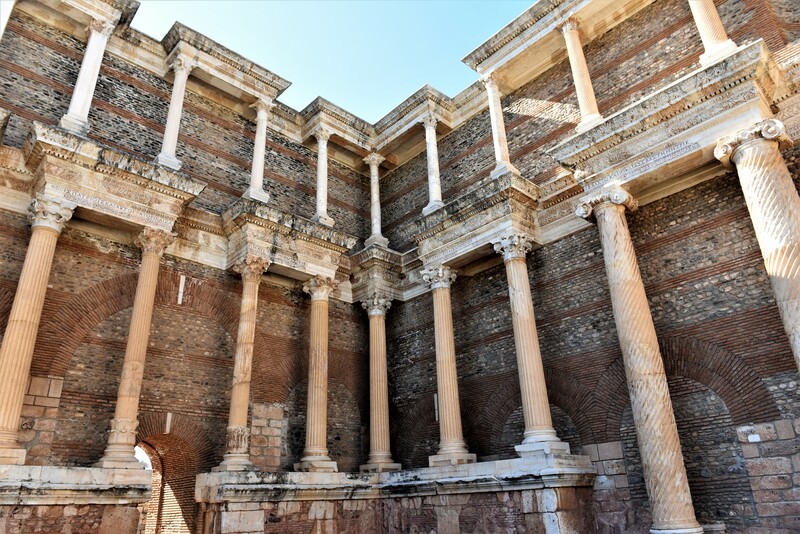 Gymnasium – Total length of the building is estimated to be 267 m and is the largest known gymnasium from the Ancient Period. 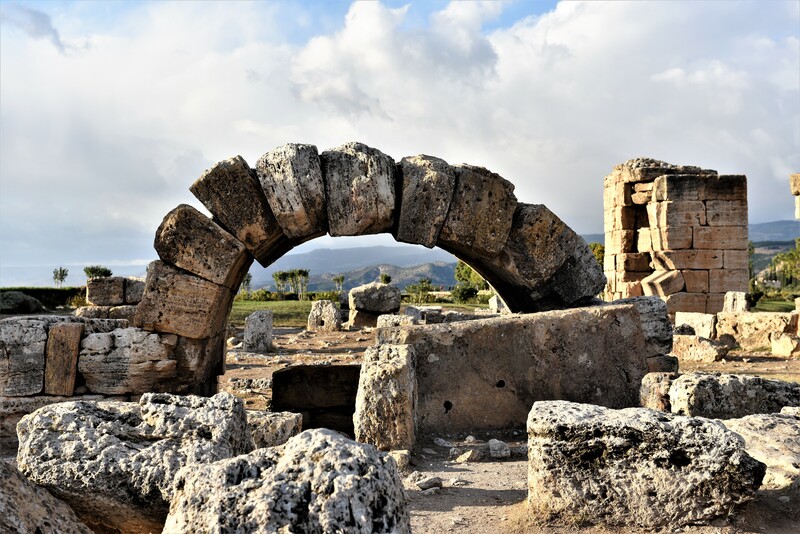 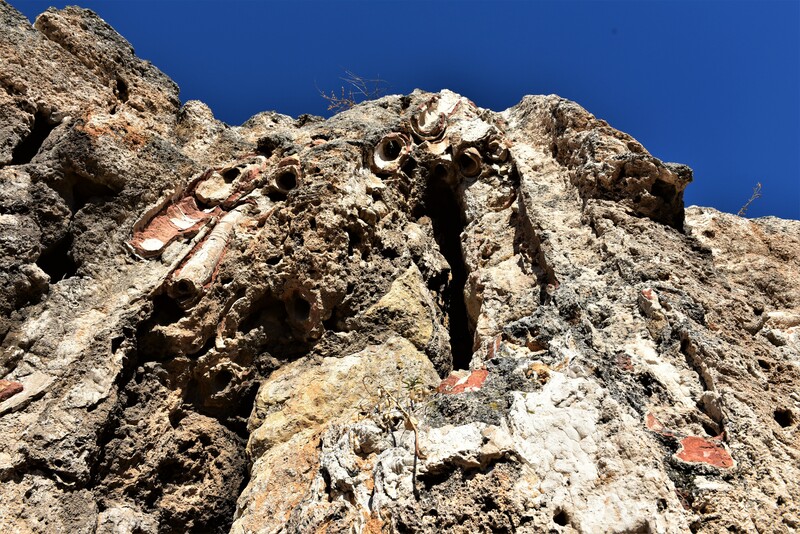 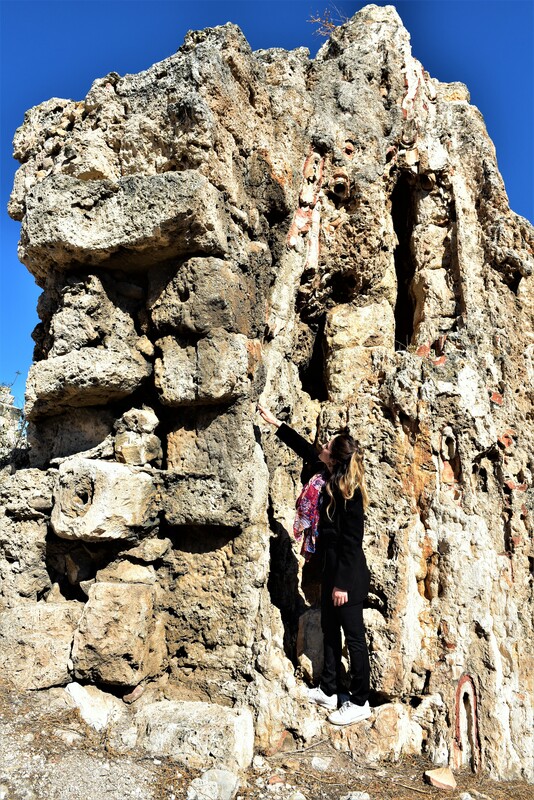 Located 82 kilometers from Izmir with a history dating back to the 5000’s B.C. 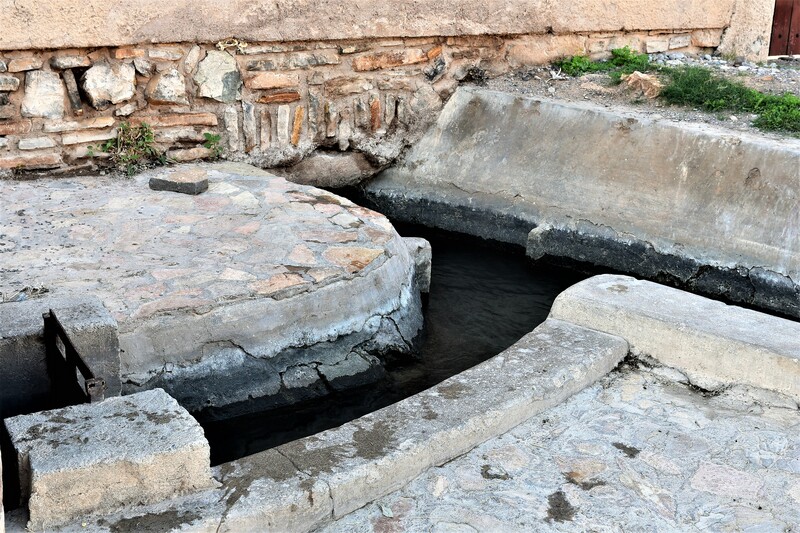 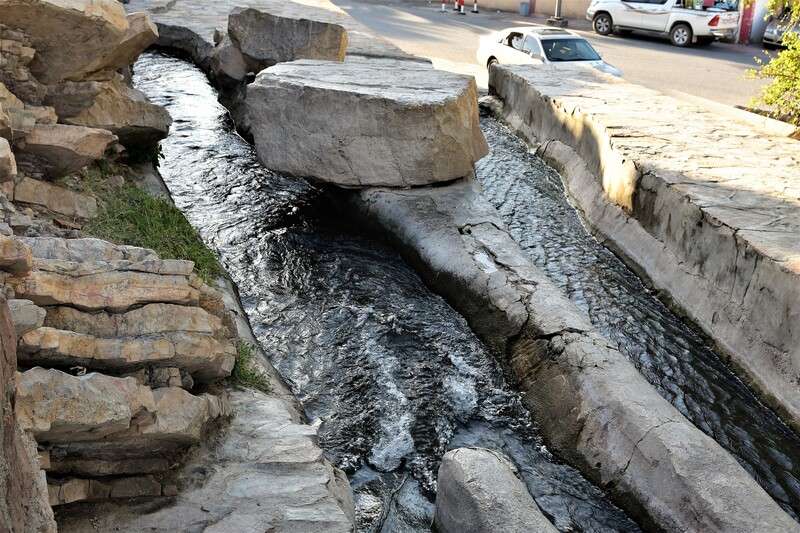 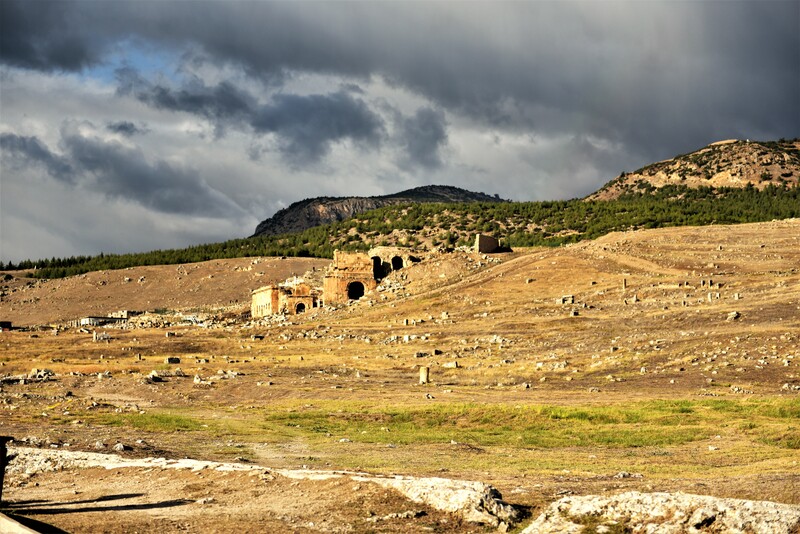 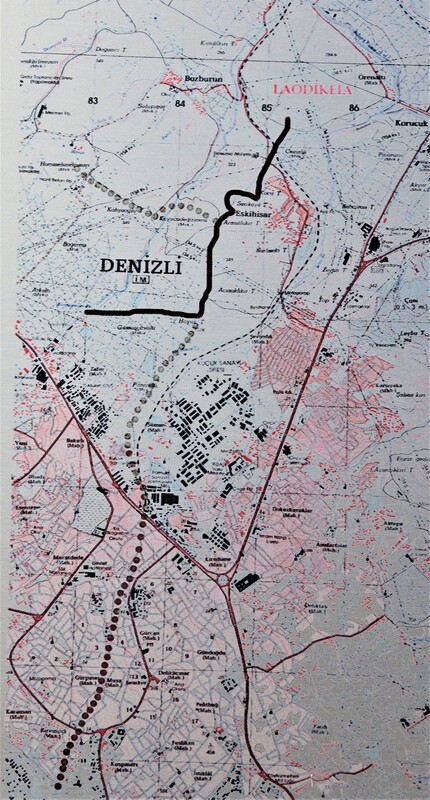 Heirapolis, located about 24 kilometers from Denizli, is at the location of Pamukkali, famous the healing waters. 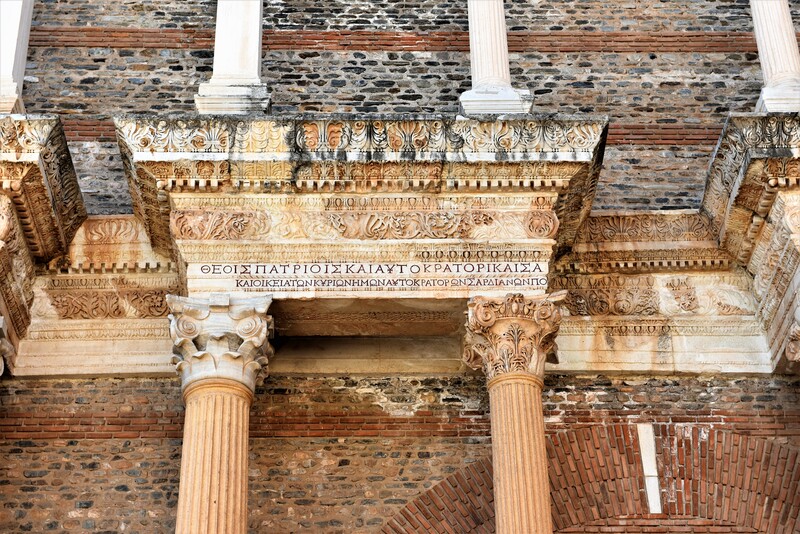 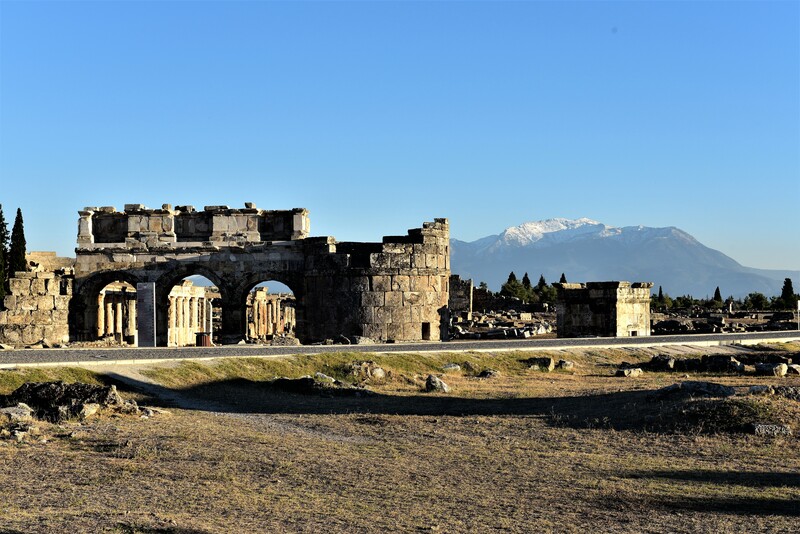 Nine major earthquakes devastated Laodikeia during it’s history in 27 BC, 47 AD, 60 AD, during the reign of Antoninus Pius (138 – 161 AD), third century AD, during the reign of Diocletian (284 – 305 AD), 494 AD, during the reign of Valens. 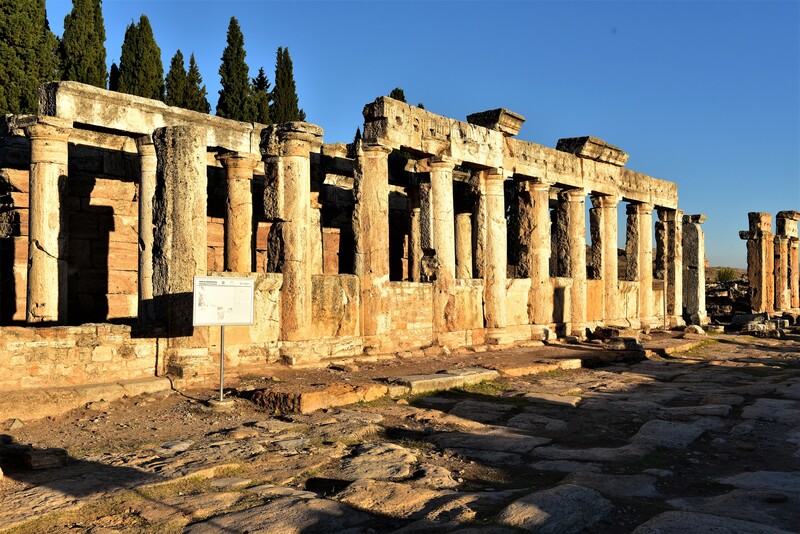 The high times of Laodikeia was during the Roman Imperial Period and Late Antiquity when Christianty spread during the 4th to 6th centuries AD. 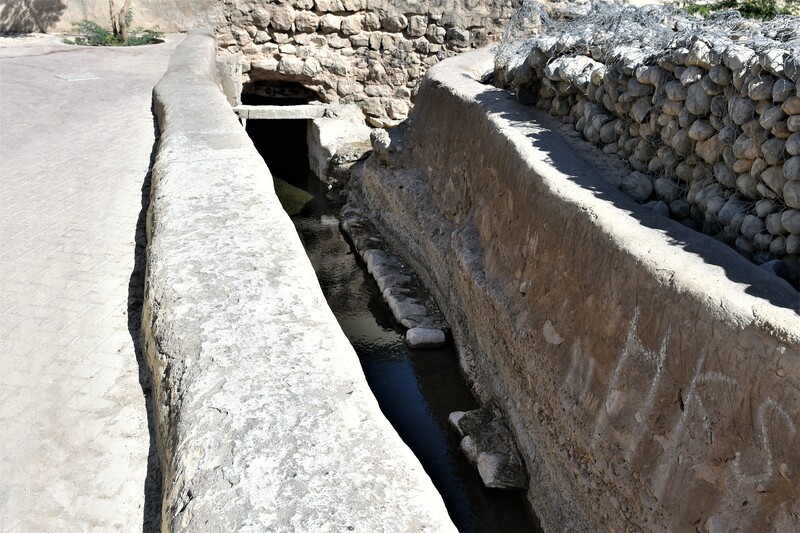 Extensive water systems were engineered and built during life of Laodikeia including castellum aquae (water distribution terminals), a siphon, baths, fountains, nymphaeum, latrines, street drain systems, pipe systems, and a baptismal. 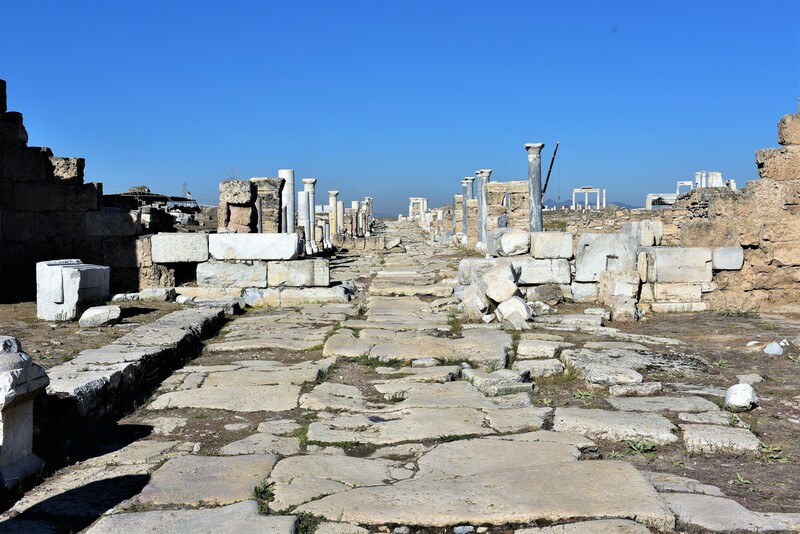 Colonnaded Syria street from Syria Gate westward to city center. 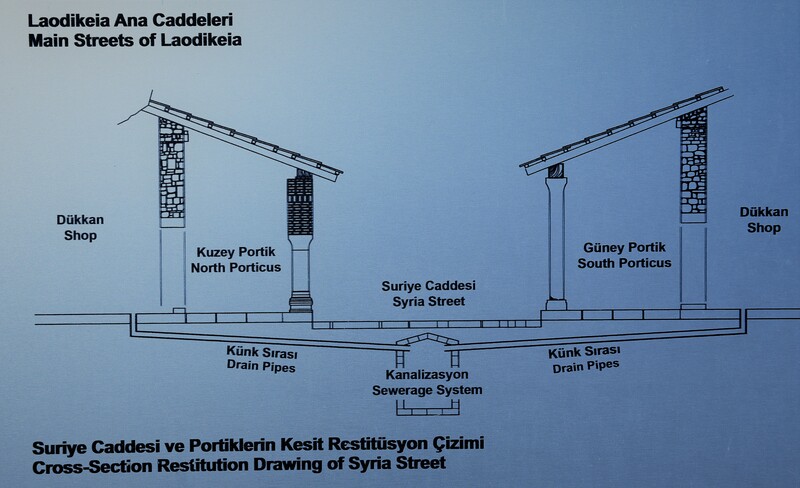 Location of drainage in middle of Syria Street. 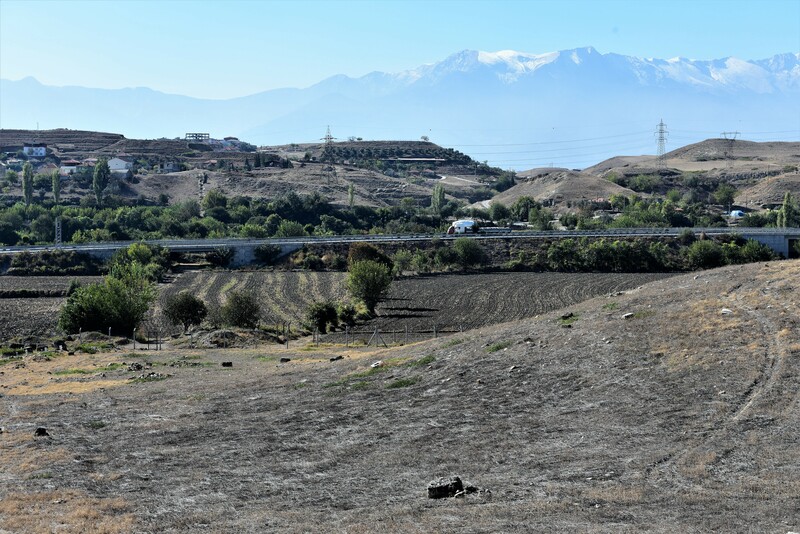 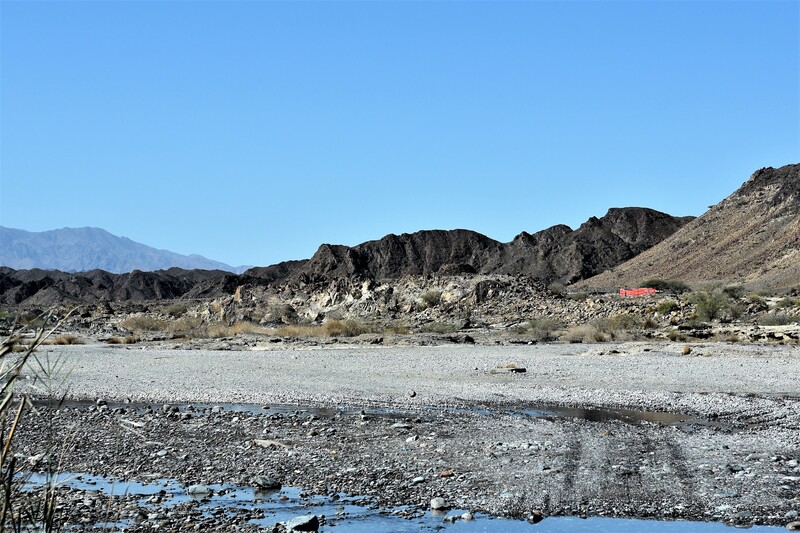 Siphon was located across the valley. 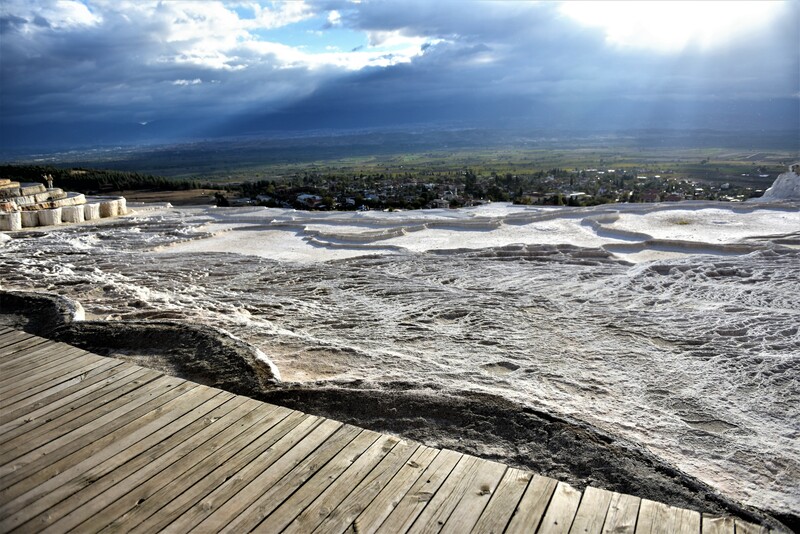 On the right is the water distribution terminal I (castellum aquae) at 278 m above sea level, east of the south bath complex and built with travertine blocks. 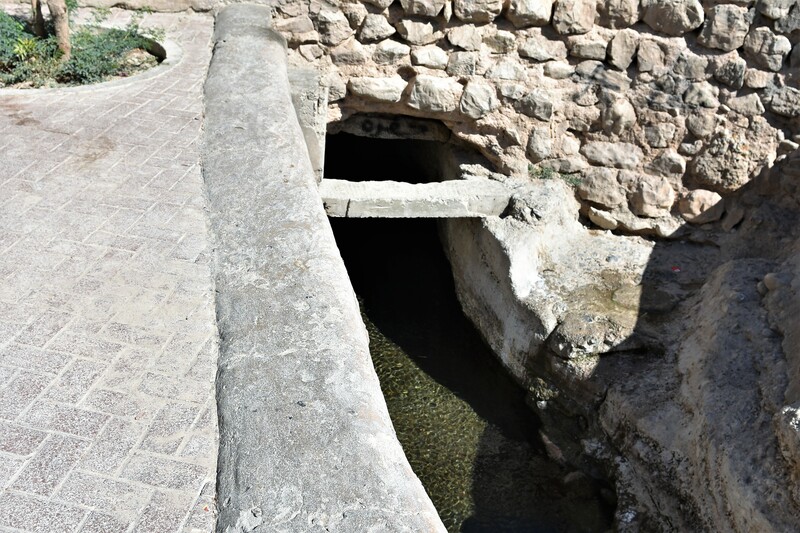 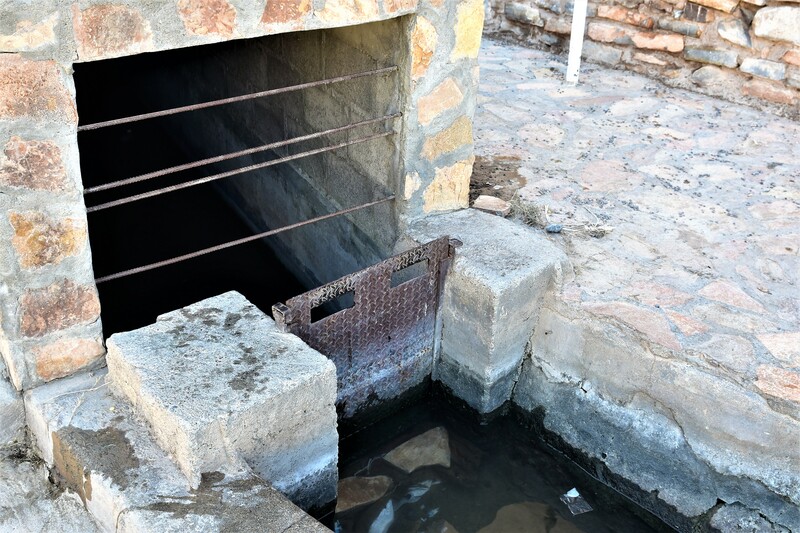 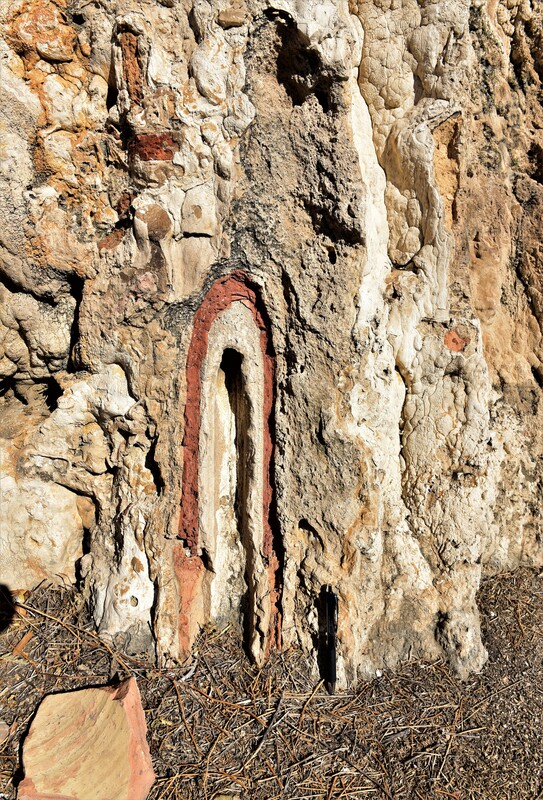 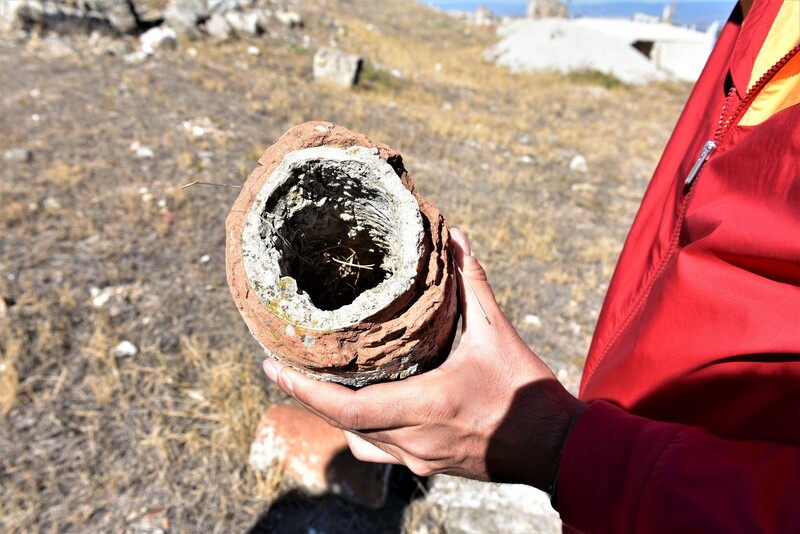 Water was supplied to this location from the Baspinar spring via two travertine pipelines (siphons) on the west slopes of Eskihisar town. 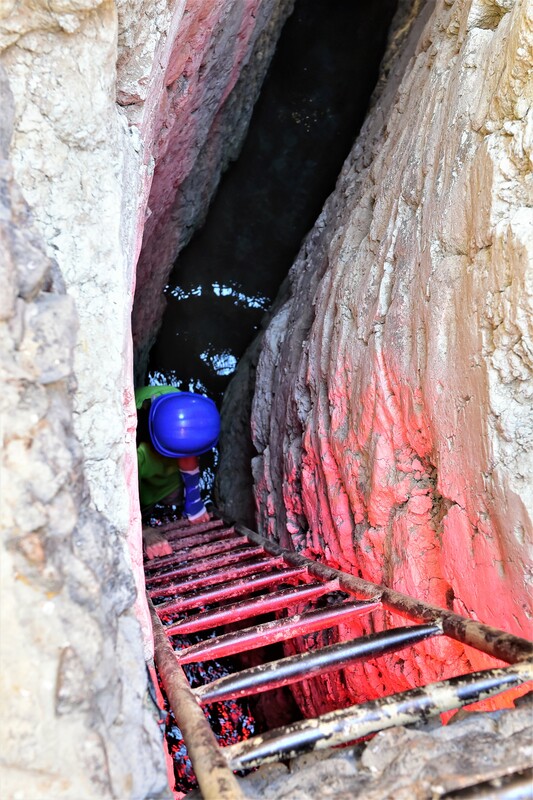 Solid line is the approximate location of the siphon. 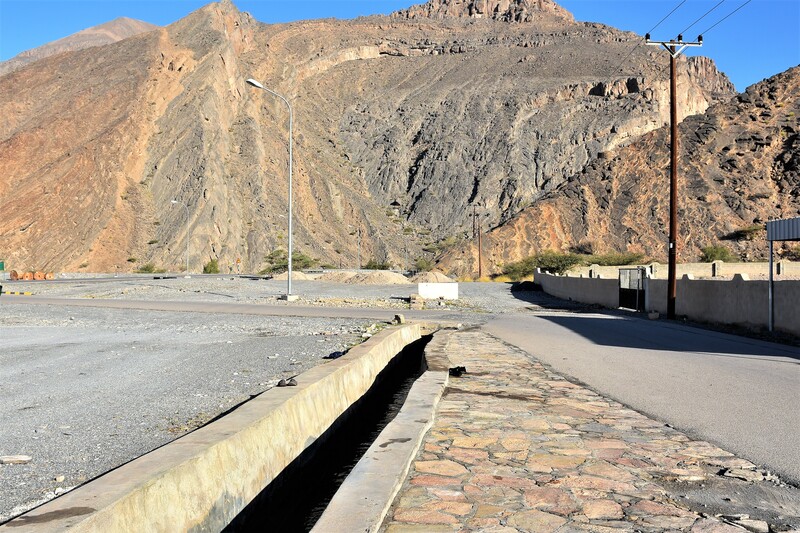 Water distribution terminal II (castellum aquae II) at elevation 291 m above sea level and 430 m north of the castellum aquae I. 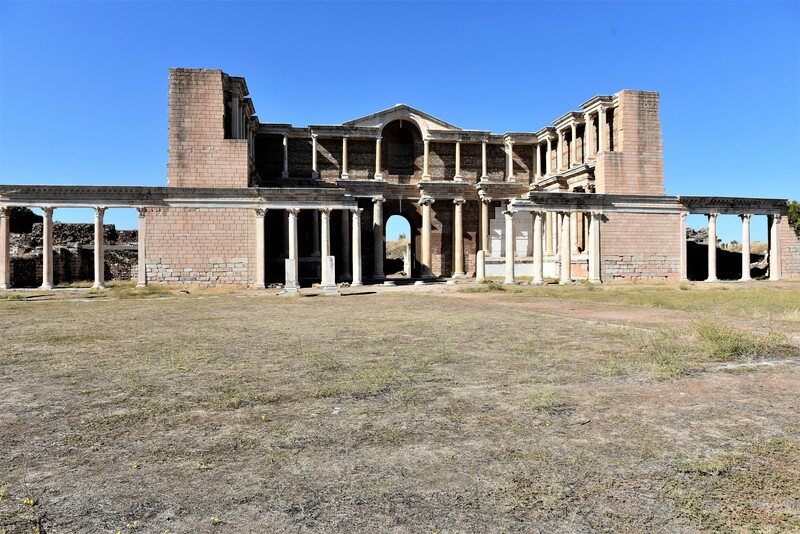 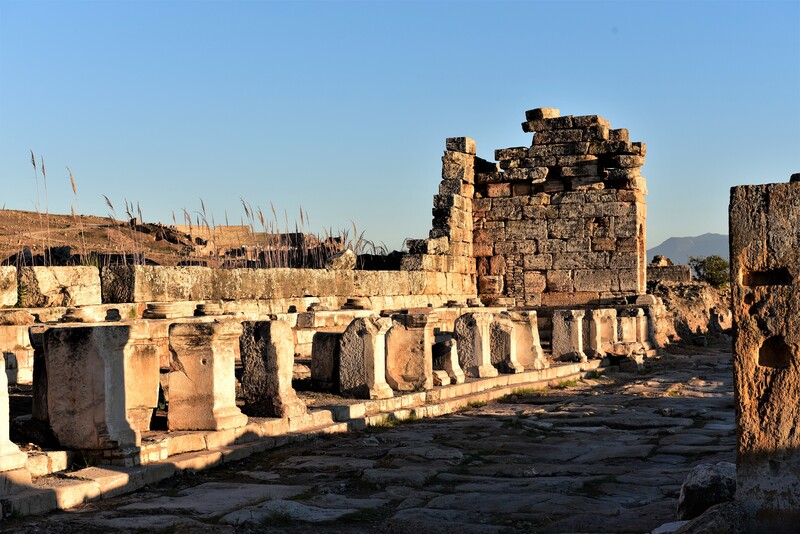 This terminal supplied a much larger area of the city than terminal I.
Ephesus (or Ephesos or Ephes) is located in the western part of Turkey along the Aegean Sea near the historical town of Selcuk (Seljuk), which is between Izmir (ancient Symrna) and Aydin. 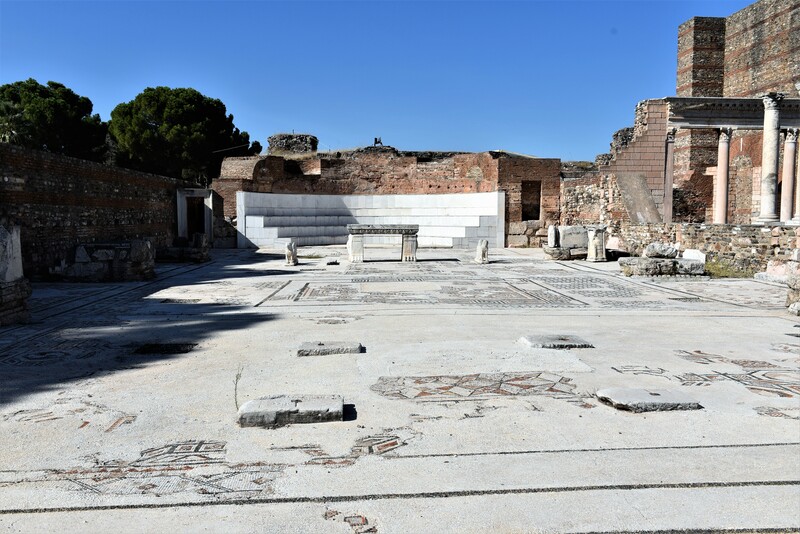 Ephesus was originally constructed on a bay where the Kucuk Menderes River (classical Kaystros). 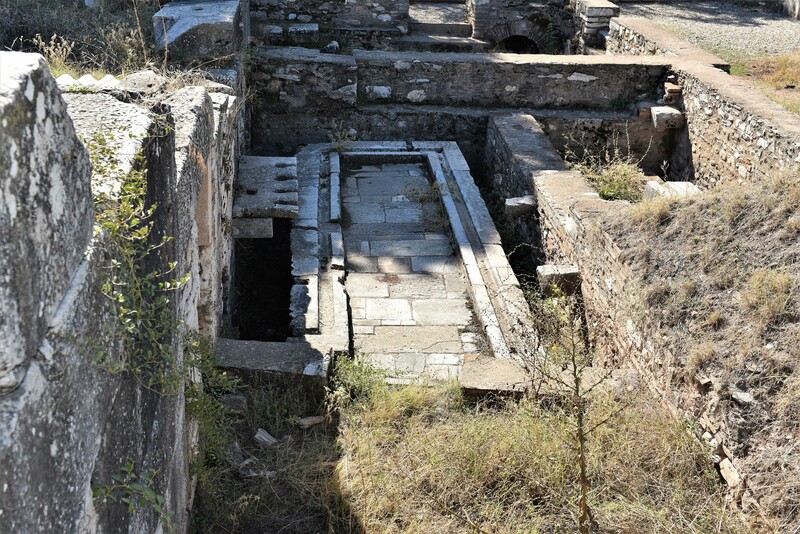 This is area is almost in the middle of ancient Ionia. 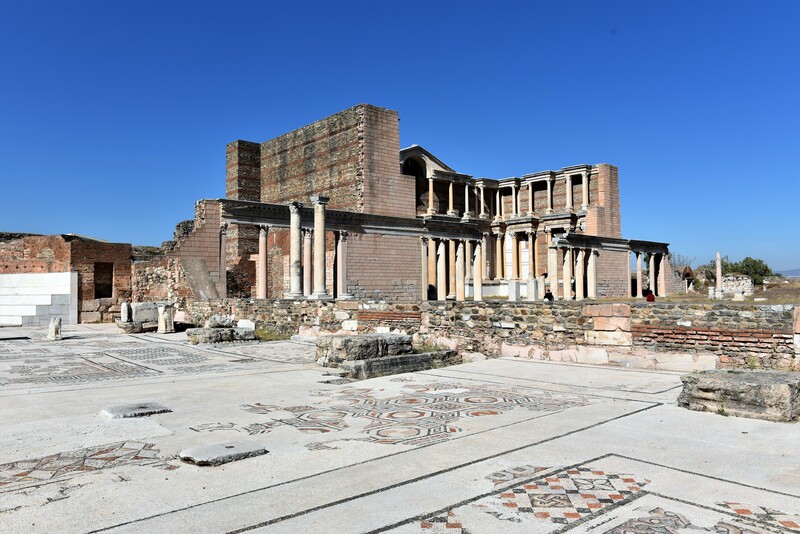 The Ioanians conquered Ephesus in the 11th century B.C. 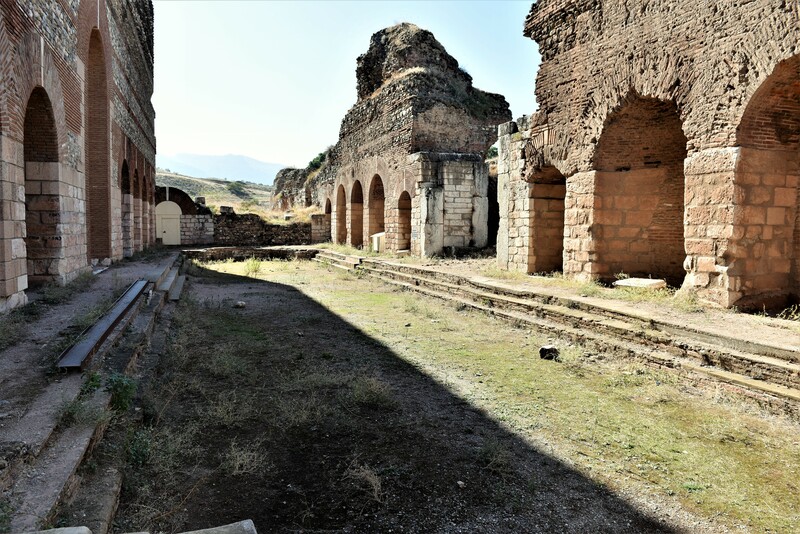 The following photos of Ephesus were taken in October 2017. 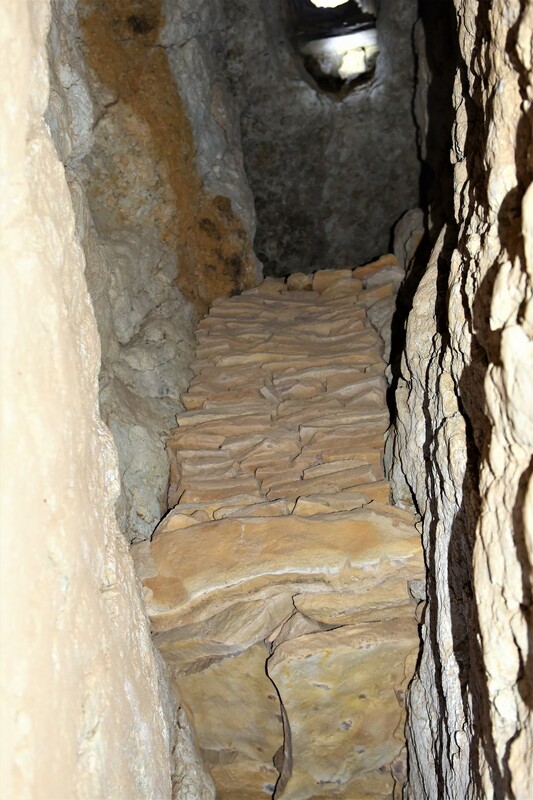 Marble Street with large underground sewer. 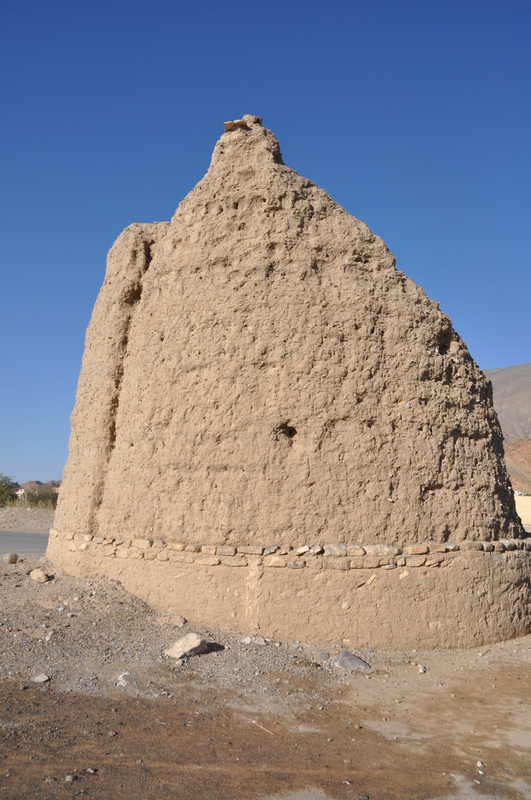 Roof in background is the location of the terrace houses. 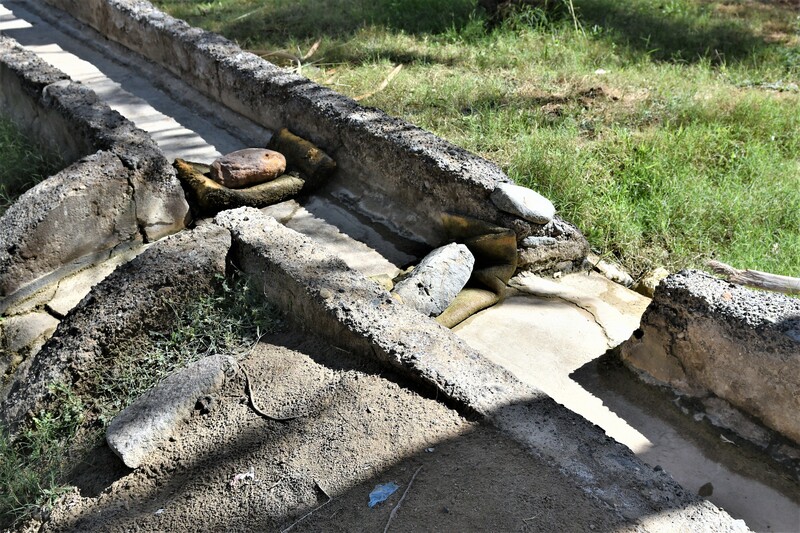 Show drainage system in theatre. 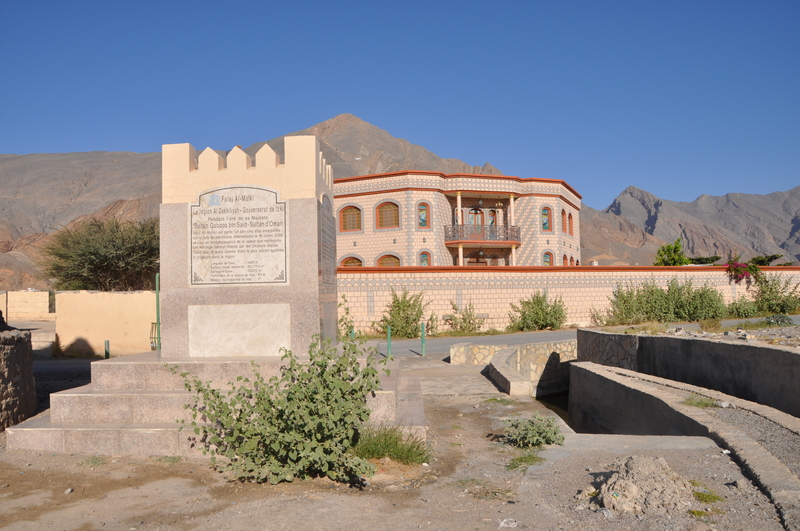 The Ayasuluk Fortress is shown in the background. 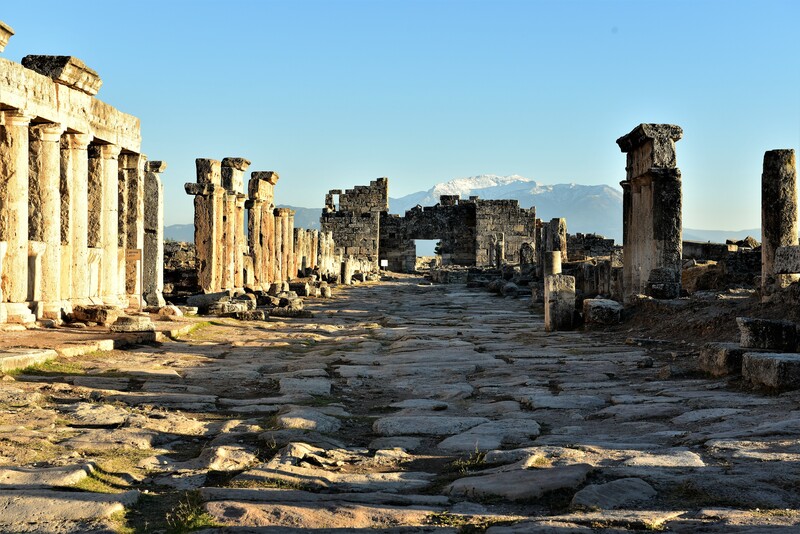 The column to the right is at the Temple of Artemis.